Congratulations to Bel Air HS 5A Boys Soccer State Champs! Visit www.yisd.net/enroll to enroll your child for the 2019-20 school year. School success begins with you. If you miss school, you miss out. Ysleta ISD.... We are the ONLY choice. Kudos to Alice Gallegos and Coach Rodriguez at Loma Terrace Elementary School! Thank you for all you do and building a strong relationship between our department and your campus and providing Service Excellence to our students! Kudos to Rebecca O'Donal at J. M. Hanks High School! Kudos to our testing coordinator Rebecca O'Donal for all the hard work, diligent effort and frenzied hours you put in to preparing and organizing the EOC's so testing could run smoothly. Your attention to detail is unsurpassed in times of extreme pressure. The extra hours you worked while maintaining a standard of excellence is your trademark. You are extremely valued and appreciated! Kudos to Officer Ron Sullivan and Carol Diaz in Security and Transportation! Thank you Officer Ron Sullivan for helping me locate a bag mistakenly left in the bus hold after a three day trip to Lubbock. Officer Sullivan made a call and quickly put me in touch with Transportation Department MCI Scheduler Carol Diaz who graciously located the bag on Sunday. Thank you so much for all your help. You are among YISD's finest. Kudos to Bel Air Boys Soccer Team! Congratulations to the Bel Air Boys Soccer team and coach Delgado for reaching the Final Four! Great way to represent Big Red, our great District and our wonderful city of El Paso. Wishing you all a state title! Stay hungry. Go Big Red! Puro Bel Air Aqui! Kudos to the mechanics in Transportation! Thank you for doing a great job in keeping the tired fleet operational. Your diligence is commendable! Kudos to Coach Hinojos at Riverside High School! Congratulation to the Riverside High School Tennis team named 2-5A District Champion girls tennis team. Thank you Coach Hinojos for your dedication and hard work ! Go Rangers! Kudos to Christine Gerlach and Patty Delgado in Purchasing! I would like to thank Cristine Gerlach for supporting THE DISTRICT with her knowledge, understanding, guidance and just being super, wonderful, kind, supportive, etc. I appreciate you throughout these years. Also Kudos to Patty Delgado for making my job a lot easier by simply 'helping' me out! Thank you ladies! Kudos to Administration at Hanks High School! A huge Thank You to the awesome administration at Hanks HS! Mr. Herrera, Mr. Caldera, Mr. Lopez & Mr. Salcido joined Mr. Gonzalez and Mrs. Batalla to complete The Dream Team. We are truly grateful for their hard work, dedication and devotion to our kids. The students love their school, going to school and participating in clubs/activities. As parents, it is obvious to us that the morale of faculty and staff has been uplifted as well as the students. I am a proud Knight alumnus and even prouder Knight parent! Thank you for the new culture and new direction of Hanks. Kudos to Arisa Carr at Pebble Hills Elementary School! Kudos to a PHES nominal Librarian! In less than a year you have managed to reenergize and remodel our school library. Your positivity and creativity has lead to an increase at the circulation desk and in student learning. We are fortunate to have you as our school librarian! Happy National Librarian Appreciation Week! Kudos to Erick Sanchez, Kay Rodriguez, Eva Avila, Raul Arroyo and Veronica Carlos in Transportation! They know what it means to be a "Team Player." They stepped it up at the Saturday bus wash and helped to get the motor coach buses ready for the soccer teams to depart on Sunday and Monday. You Rock! Kudos to Ruth Saenz and George Armenta at Hanks High School! Thank you Ruth and George for doing such great work in the attendance office. You've both been working so hard to get our attendance numbers up all while providing great customer service to our parents and staff. Know that your hard work has not gone unnoticed. Keep up the great job! Kudos to Jennifer Delgadillo in Accounting! Congratulations on make it to not just one Hall of Fame, but two of them! The El Paso Golf Hall of Fame and the El Paso Athletic Hall of Fame. You are awesome! Kudos to Robert Murillo at Roofing Department! Kudos to Robert for always going above and beyond. He is always willing to help and will make sure any job he works on is done correctly. He is always making sure the school is safe for all students anytime he visits. Kudos to Roger Bustamante at Maintenance! Kudos to Roger for his professional and willingness to accomplish his plumbing work at Vista Hills. We appreciate his dependability and commitment.Thank you very much! Kudos to Security at Del Valle Middle School! I would like to say thank you to the security department. We filed a claim for our daughter's stolen phone and she got it back the next day. It seems like the security officers really care about the safety and well being of the students. Keep up the good job guys! Kudos to Candace Gonzalez, Drina Hernandez and Arlene Reyes at Tierra Del Sol Elementary School! I just wanted to take the time to recognize some amazing teachers at my daughter's, school. Mrs.Gonzalez, Mrs.Hernandez, and Mrs.Reyes are all such amazing teachers. They have made such a difference in both of my daughters' lives and the way they look at school. They love going to school and cannot wait to see their teachers everyday. I am thankful for Tierra Del Sol and what the faculty, administration, and staff have done for my children on a daily basis. Kudos to Matthew Garcia at Hanks High School! Matt Garcia in the Hanks AP office does an awesome job! He is always holding down the fort, working hard, and doing it all with a smile. Hanks is blessed to have such an amazing young man. Kudos to the Bel Air High School coaching staff! I would like to thank Coach Scogin, Coach Levario, Coach Trevizo, Coach Wells, Coach Hash and Coach Carrillo and the rest of the Bel Air Football staff for their outstanding work over the past two months. I have seen a drastic change in my son and the football program. From 7 on 7, to linemen challenges, to competition Friday's. I love what I am seeing and can't wait till next football season. Kudos to Alex Reyes at Innovative Learning! Kudos to Alex for his help with scoring at the Superintendent's Cup and throughout the year! We appreciate your support at the campuses with your expertise and knowledge and above all your willingness to always help students, teachers and colleagues! Thank you! Kudos to Grace Maldonado at Edgemere Elementary School! Grace Maldonado is the most caring and passionate nurse. She treats the children with empathy and respect. No matter how busy she is, she smiles and shows each child that they matter. Kudos to Del Valle Middle School security! Thank you for everything that you do! In the mornings it is nice to see you greeting the students with a smile on your face as you help direct traffic. I feel safe leaving my kids at this new campus because I know Mrs. Perales and your security guys genuinely care for the students. Kudos to Rebecca Friesenhahn at Accounting! After reviewing my PO report, I sent Rebecca Friesenhahn multiple change orders. By the next morning she had already processed ALL of them! At this time when we are all watching our pennies, it is a tremendous help to us to get our funds released quickly. She is another one of the people that make us THE DISTRICT! Just wanted everyone to know what an amazing asset she is to YISD. Kudos to Gerardo Cardenas and Edgar Hernandez at Maintenance! I would like to recognize these hard working employees for installing much needed electrical receptacles in the Head Custodian's office. Their willingness to get the job done professionally and in a timely manner is greatly admired. Thank you very much! Kudos to Mario Gomez, Carol Diaz, and Luis Valdez at Transportation! Good things come in 3's! That is true for Transportation. Carol, Mario and Luis thank you for helping....more than you know! Transportation Rocks! Kudos to Teresa Sarabia at Edgemere Elementary School! Terry is the beloved Registrar Clerk at Edgemere who consistently models service excellence by demonstrating courtesy and accountability. She greets everyone with a smile and always presents herself with a happy personality that is contagious. She is willing to help all in any way that she can. Kudos to the nurses at Hanks HS and Indian Ridge MS! Awesome job to nurses Laura Guereque, Myra Cossio and Jennifer Sanchez for organizing a great Health Fair at Hanks HS on Parent Night! It was very informative and helpful. Thank you! Kudos to Coach Chris Mora at Hanks High School! Congratulations! Coach Mora, coaching staff and Boys Varsity Basketball team on an amazing basketball season! 2018 -19 Bi-District Basketball Champs! Kudos to Michelle Gamboa at Edgemere Elementary School! Mrs. Gamboa demonstrates service excellence by displaying innovation when working with students to support academic needs even if they are outside of her normal art program responsibilities. In addition, she shows innovation when preparing projects and performances for the students of Edgemere. She is courteous when working with teachers, parent and students. Kudos to Casey Rangel at Hanks High School! As a wrestling coach at Eastwood High School, I know my girls are in good hands when we have Casey Rangel on our side. At the state tournament, he was the first to come to our aid when one of our girls got hurt and made sure to check on her during any given moment. My girls love him and he puts them at ease -- thank you! Kudos to Marco Garduno and custodial staff at Eastwood Middle School! A huge "Thank You" goes out to Mr. Garduno and all EMS custodial staff for always coming through to help on any iniative the counseling team has put together, especially last minute events. Their efforts have not gone unnoticed and they do it with a smile! You are amazing! Kudos to Luis Serna, head custodian at Loma Terrace Elementary School! As a teacher visiting Loma Terrace Elementary School for Sharon Wells training, Mr. Serna was very welcoming. He constantly was checking on us to make sure the temperature in the room was comfortable and making sure that the staff at the training had everything we needed. I had never felt so welcomed by a staff member before. What a great asset to the campus! Kudos to Norma Garcia from Indian Ridge Middle School! Kudos to Sgt. Joe Flores at Bel Air High School! It is with gratitude that I write this thank you to Sgt. Joe Flores. His dedication, follow through, and over all willingness to go above and beyond in his work duties was evident while helping at BAHS. You are a good man/human being. Kudos to YISD Girls Wrestlers! Congratulations to the Hanks High School Girls Wrestling team and Coach Anthony Carter for your unprecedented 6th consecutive State 5A Wrestling Championship! And congratulations to Eastwood's Danielle Saldivar for winning gold! Way to represent #THEDISTRICT! Kudos to Sylvia Esparza at Hanks High School! As the Budget Clerk, I receive many boxes that need to be delivered to classrooms. I often call for an available custodian and always receive an answer from Sylvia. Thank you Sylvia for your serviceable attitude and quick response when calling for help with deliveries or paper deliveries to workroom areas. Your willingness to help, although you may run behind on your own duties, is truly admirable. While no one else may notice, I do. You are a team player and have been a great example of Service Excellence! Kudos to Kelly Weddington in Fine Arts! Thank you Ms. Weddington for being an outstanding teacher and mentor! My daughter loves being in your orchestra class and it was amazing to see her perform in the Honors Orchestra. Kudos to Pat Tellez and Leslie Spencer! Thank you for all that you do for the students and staff at Scotsdale Elementary School. The Peace Rally that you put together sent a powerful message to our students on the importance of kindness and acceptance of others. You Rock! Kudos to Mr. Gaytan's heavy equipment team! This team was an awesome team. They did an outstanding job tearing down a tree in front of the school. They were all on task and very focused on completing it in a timely manner! Kudos to the heavy equipment team! Kudos to Mr. Enrique Herrera at Hanks High School! We have seen a positive change in the culture at Hanks. We appreciate that you care so much for the kids and always show your support. We are honored to have you in the Hanks area. Kudos to Monica Vasquez at Purchasing Dept! A huge Lion thank you to Monica Vasquez for taking care of our Loma Terrace teachers and students. She went above and beyond to make sure our teachers and students have the materials they need to make their educational experience here at Loma Terrace a reality. It's all about teamwork between our YISD Central Office and the campuses and Monica is a perfect example of that! Kudos to Myra Cossio, LVN from Hanks High School! I want to thank Myra Cossio LVN for being so welcoming! Everyone here at Hanks has taken me in as one of their own! Working alongside Myra has been amazing! I've never worked with an LVN before, but it's a great experience to have a partner! Go Knights! Kudos to Esteban Figeroa from Central Office! We want to thank you so much for all your patience and attention in helping us retrieve the W2 form we needed. You were so helpful and so very patient. We need more people like you in this world. Kudos to Alicia R. Chacon International School office! Cynthia, Abby, Angie, and Bonnie: Thank you ladies for all your hard work and dedication! Kudos to Pat O'Neill, Chief Operations Officer! Thank you for your leadership throughout your many years as an educator and administrator. You will be truly missed and we wish you and Mrs. O'Neill the very best in your retirement. God Bless both you and your family. Kudos to Liz Lara at Pebble Hills Elementary School! Kudos to Cathy Chavez from Constance Hulbert Elementary School! Ms. Chavez, our school counselor, has been a great addition to our CHES family. She is always on the go, willing to help anyone that crosses her path. Thank you for all of your hard work and dedication to your students! Kudos to Teresa Ochoa from Hacienda Heights Elementary School! We would like to recognize and thank Mrs. Ochoa for her dedication to our school! We appreciate her very much for everything that she does! Happy School Counseling Week! Kudos to Wendy Banegas and Erika Ferreyra at Presa Elementary School! Thank you very much true educators Mrs. Ferreyra and Mrs. Banegas. You ladies truly believe in the success of your students. Thank you for all the help and support you gave to my granddaughter Ahlia. I just received here report card. I greatly appreciate your assistance. Kudos to Lorena Soto, counselor at Dolphin Terrace Elementary School! Thank you for the excellent Career Day activity. Everything was perfect from start to finish. Presenters were on point, the booths interesting, and students engaged You rock! Kudos to Luis Serna and custodial staff at Loma Terrace Elementary School! Kudos to Mr. Serna and the Loma Terrace Custodial Staff for all they do for our school. Mr. Serna is always busy doing something around the school. He is so helpful with anything the teachers need help with. He also has a caring demeanor towards all the students. Everyone in our custodial staff are always willing to help out in anyway they can. Thank you all! Kudos to Cheryl Nuebert in Academics! We would like to take the time the recognize Cheryl for all the support she has given the teachers at East Point Elementary. She has shown the standards of Courtesy, Innovation and Accountability by helping support our campus this year. She has been amazing and supportive and on behalf of the staff at East Point, we thank you. View moe Service Excellence Kudos. Kudos to Hope Gomez at Bel Air High School! Hope Gomez is a remarkable volunteer. For the last 8 years she has been a constant figure on campus. Good or bad, the school always needs her. She is dedicated and loyal to BAHS.I would like to personally thank her for all she has done (not only for me, but anyone who needs her). She does it with pride, honesty, enforcership,and above all with love in her heart and willingness to take the good with the bad. I am proud to have grown in friendship with her. I wish her blessings this coming 2019 year and a continued exuberance/love for BAHS. Kudos to Ms. Leonor Terrazas from Ascarate Elementary School! Ms. Terrazas is a very special person in our school. All the kids love her, including teachers and especially me, a volunteer at Ascarate. She is always looking to see if the kids need help in one way or another. Ms. Terrazas is an angel for all those kids she is around. We love her! Kudos to the Ysleta ISD Board of Trustees! Kudos to the YISD Board of Trustees for their commitment to students in TheDistrict! Your professionalism, dedication and advocacy for our students and staff do not go unnoticed. On behalf of all YISD employees and students Thank You! Kudos to Genoveva Jenny Lara at YISD Transportation! I would like to thank Jenny for her dedication to YISD Transportation. Her 26 years of service is remarkable. It has been a pleasure to know you and work with you. I pray you have a blessed retirement. Turn your tears into glorious cheers my friend! Don't forget us. Kudos to YISD Special Education staff! A big "thank you" to the entire YISD Special Education department for the holiday event held at TLCC. Thank you for your infinite patience and love for the children and for your work to give them a fun Christmas party. The singing, photos, food, and fun were all awesome. My son loved every minute. Your work does not go unnoticed! I appreciate you. Kudos to Mrs. Diana Angeles at Pasodale Elementary School! I would like to thank Ms. Angeles as she is such an awesome teacher. She has helped my son a lot and she has lots of patience. I am very happy with her. Thank you very much for all you have done! Kudos to Georgina Tafoya, Parkland feeder area Austism team, Special Education! Ms. Gina is a hard worker, always goes above and beyond for our students and families. The first to take initiative and offers to do extra when ever she can. Very professional, caring, patient and supportive. Thank you Gina for all that you do! Kudos to Allison Palmeira at REL Washington Elementary School! I want to recognize excellent 4th grade teacher Ms. Palmera. She is always there to help her students to succeed. Thank you for your dedication for each and everyone of your students! Kudos to Josephine Flores at Edgemere Elementary School! Ms. Flores is an awesome and caring teacher. I can not express my sincere gratitude for this awesome teacher. She has had both my kids 10 years apart and I could not have been more blessed to have her educate and teach my kids life lessons. To this day my 18 year old says patience is a life lesson which he learned from Ms. Flores, his kindergarten teacher. Edgemere elementary is so lucky to have this exceptional teacher. Kudos to Ms. Laura Calderon and administrative staff at Vista Hills Elementary School! Ms. Calderon truly cares for each child and that same feeling extends to her admin staff. I appreciate the open door policy and the kindness you and the staff show. From the front office, to the nurse and counselor, Ms. Cervantes's priority is the children of this campus. She looks for innovative ways to help them and we are so grateful! Nurse Dee is kind and cares for the kids. Thank you for caring! Kudos to Diana Griego at East Point Elementary School! Ms. Griego is an excellent teacher. She has given my son all the special attention he has needed, as well as a lot of patience. I am very happy to have her this year as my son's teacher. Kudos to Rebecca Rodriguez and Hector Gallegos at Parkland High School Band! Ms. Rodriguez and Mr. Gallegos are two outstanding individuals. They continuously go above and beyond for the band program and the kids. They take their personal time and work with the kids to make the kids better individuals and human beings. This year was a historic year due to both of these outstanding facilitators. Kudos to Charlene Estrada at Hacienda Heights Elementary School! Charlene is an individual dedicated to her assigned tasks. She is a crossing guard and a mighty great crossing guard. I am comfortable allowing my children cross at her assigned location especially because I know she will always ensure my children, as well as every other individual who crosses at her location safely. Like the post office. She is there rain, sleet, or shine! Kudos to Ysleta ISD students and teachers! Kudos to our noble-hearted elementary, middle, and high school students who created handmade holiday cards for the children held in the Tornillo detention center. Your thoughtful messages are sure to bring holiday cheer to thousands of children who are not with their families this year. A big thank you to the students and teachers who participated in this project. You embody the true spirit of Christmas! Kudos to Yvette Young and Lino Fragoso at YISD Print Shop! A HUGE thank you to Yvette, Lino and the Print Shop staff for their awesome work and excellent customer service! Everything we have requested is completed fast and always looks amazing. Keep up the great work! Kudos to Mary Ortega from REL Washington Elementary School! I would like to recognize Mary Ortega, clerk at REL Washington Elementary School. She is so kind, helpful and always greets. Thanks for her help. Kudos to Mr. Charles Garica and Bel Air HS administrators! Kudos to Jose Chavez in Maintenance! I would like to recognize Mr. Jose Chavez for his honesty in returning my lost credit card. It is good to know that YISD counts on trustworthy and honorable employees.Thank you Mr. Jose Chavez and Happy Holidays to you and your family. Kudos to Lori Armendariz at Eastwood Heights Elementary School! Lori is an amazing, dedicated, compassionate, kind nurse always willing to help students with a smile on her face. She also helps staff in any way she can. Thank you Nurse Lori! Kudos to Erick Buenrostro from Innovative Learning Dept.! Erick provides the resources when we need help and when we can't get the answer we are looking for. He goes out of his way to personally take care of an issue with our teacher devices. Thank you for extending great customer service Erick! Kudos to Abraham Trujillo, Hector Gomez, and Luciano Alcala from Bel Air Middle School! Mr. Trujillo, Mr. Gomez, and Mr. Alcala are amazing professionals that contribute to campus success in ways that go above their job descriptions. They will help any student, staff member or parent without question. Their commitment to the success of our campus is greatly appreciated! Kudos to Riverside High School English Department! I feel so grateful to you all for taking time out of your busy schedule to help me out while I was out. Without your help, I would not have been able to help my students in such a proficient and timely manner. You all have been a blessing! Kudos to Librarians at Del Valle Learning Community! Congratulations to our Del Valle area Librarians who put on an AMAZING Family Literacy Night. OFOD! Kudos to Nurse Alma Govea at Alicia R. Chacon International School! I would like to recognize Ms. Govea for all of your great work and dedication. Thank you for always having a smile for our students everyday. Kudos to Mayela Sepulveda at Tejas School of Choice! Thank you to Mrs. Sepulveda and your Tejas students for your direction and work on a mural along the Playa Drain Trail! Together, with your Ascarate Elementary students, you made a lasting contribution to this project by the El Paso del Norte Health Foundation. Thank you to principal Dr. Lucy Lozano-Lerma for her support and positive influence to our teachers and students which allows our campus to excel in academics and community involvement. Kudos! Kudos to Jorge Castaneda, crossing guard and monitor at Indian Ridge MS! Jorge is always willing to lend a helping hand when needed anywhere and anytime, always volunteering his time no questions asked. He is a hard worker and wonderful asset to IRMS. Kudos to Jorge for your outstanding work! Kudos to Mrs. Vicki Dibler and Mrs. Zelia Wittke from REL Washington Elementary School! Thank you Mrs. Dibler and Mrs. Wittke for always being so patient, helpful, knowledgeable, and willing o help us teachers in every way possible. Your unconditional support makes our jobs more productive and less stressful. Most importantly, thank you for caring and wanting the best for our students and always doing it with smiles on your faces. Our campus is truly blessed to have you both! Kudos to Jacqueline Calzada at Indian Ridge Middle School! I would like to recognize my co-teacher for 9th period, Mrs. Calzada! She goes above and beyond working in small groups and accommodating all of our IRMS Hawks! Go Hawks. We SOAR. Kudos to Mr. Charles Garcia, Principal at Bel Air High School! I want to thank Mr. Garcia for putting a priceless smile on my son Nathaniel's face at the Bel Air/Del Valle game. Mr. Garcia, thank you truly for giving my son an experience he will never forget! And a big thank you also to the football players for making my son feel like part of the team. You and your administrative team are really true to when you say that you care for all your students. Your act of kindness, care and sincerity I know are true and this will never go unforgotten! God Bless you always. Kudos to Administration and Staff at Ramona Elementary School! Thank you to Ms. Medlin, Ms. Solis, and the Ramona Elementary administration and staff for their attention toward the Cafeteria Staff during the National School Lunch Week. We felt very appreciated and are blessed to work here! Kudos to Ms. Rodriguez, her team and the Parkland High School band! A big congratulations to Ms. Rodriguez, her team of directors and the Parkland High School Marching Matador Band who came in 1st Place Grand Champions in Class B at the SISD Marchfest! They also won Outstanding Drum Major, Outstanding Guard, Outstanding Percussion, Outstanding Wind Ensemble, Outstanding General Effect and Outstanding Marching for their division! Their hard work, dedication and perseverance definitely shows from all their amazing achievements! Great job Parkland High School Band, you all are rock stars! Kudos to Wellness Clinic at Central Office! Big thank you to the ladies at the Wellness Clinic. Ms. Kristal, Ms. Renee and Dr. Bihla. You ladies are awesome! Always welcoming us employees with a smile and ready to make us feel better. Keep up the good work. Kudos to big Red Pride Marching Band! Congratulations on a great marching season and your accomplishments at BOA Regionals in California. Champions in Class 3A Prelims, Best in Music and General Effect, sixth place overall in finals. GO BIG RED! Kudos to Del Norte Heights Elementary School Leadership Team! Our DNES leadership team and support staff are just great. With the shortage of subs in the district, everyone is always willing to help out in coverage even though their plates are full. They are truly there for the students in every way possible. Great team effort! Kudos to Patty Santos at North Loop Elementary School! Ms. Santos is the best librarian because she is always willing to try new things and help anyone. She is very innovative in her library and teaches the students 21st century skills. Students love going to the library and learning new things from her. Thank you Ms. Santos for all you do! Kudos to Aubrae Trujillo in Accounting! Thank you for always being helpful, kind and never saying no. Your help is greatly appreciated. Kudos to Ms. Teresa Perez at REL Washington Elementary School! I want to tell my teacher that she is doing a great job and I feel like I will learn so much from her. She is a new teacher at my school and I want her to know that she is awesome! Kudos to Administration at Dolphin Terrace Elementary School! Happy Bosses Day to our hard-working admin at Dolphin Terrace, Lorraine Martinez and Jorge Reyes. Your example of leadership and professionalism is inspiring. Kudos to Sonia Padilla in Technology Information Services! Ms. Sonia Padilla is a great asset. She helps me out with reports, answers questions when I ask, always returns my calls, is very polite and efficient, guides me through the process of entering and teaches me new and easier ways that allow me to complete my job. Kudos Ms. Sonia and thank you for always being available. Kudos to 5th grade teachers at REL Washington Elementary School! I would like to recognize all my teachers this year. They are great teachers and always willing to help me and every student. They are super nice and always happy. They come in with a smile on there face and greet everyone. I love them. I already know that I am going to have a great year! Great job Mr.Sierra, Mrs. Collins, Mrs. Anderson, and Mr. Chanez! Kudos to Joe Flores at Technology Information Services! Joe Flores provided immediate help at Edgemere Elementary with the installation of our security camera operating system connecting it to our new security monitors. Mr. Flores was professional, courteous, and willing to accommodate way above and beyond what was asked of him. He arrived at our campus at approximately 2:30 pm and did not leave until after 6:30 pm. Mr. Flores showed innovation and courtesy when he refused to leave until the operation system was 100% functional providing us the safety and accountibility we were striving to obtain. 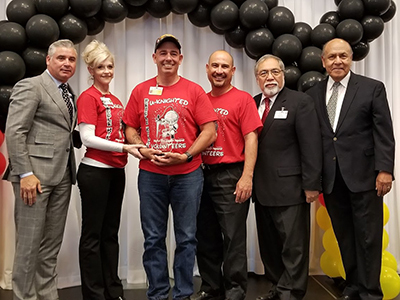 It is because of employees like Joe Flores that YISD is "THE DISTRICT." Kudos to Coach Duran at REL Washington Elementary School! We have amazing teachers at REL Washington Elementary and Coach Duran is one of them. She is always making sure the kids are safe. Teaching the kids to be healthy by exercising. Coach Duran is awesome and the kids love her. Thank you for being that amazing person and always having a positive attitude. Kudos to Tury Alvarez and Custodial Staff at Hacienda Heights International School! Tury, Lorenzo, Rosa, and Maria, our school sparkles because of YOU! Thank you for making our school shine. Your hard work and efforts make our school a brighter place to be. It is greatly appreciated and we thank you. Hacienda Heights International School faculty and staff! Kudos to Melissa Castillo at Rio Bravo Middle School! I am new at Rio Bravo, but Ms. Castillo made me feel welcome from the first day I met her at a summer training. She has not changed since. She is always willing to help, to talk or to listen. I would not be doing as well as I am if it wasn't for her. On a personal note, she is very nice and sincere. On a professional note, she loves teaching and is very thoughtful in how she prepares, plans and delivers her lessons. I am thankful she is here at Rio Bravo Middle School. Thank you, Ms. Castillo. Kudos to Karen McVay from Plato Academy! Testing Coordinator Karen McVay wears many hats at Plato. She serves on LPAC, CEIC, RtI, to name a few, and is always willing to help faculty and staff. Her passion is assisting current and former students (some of whom were under TAKS and TAAS) in assuring they reach their academic goals. Mrs. McVay is a treasure and we are fortunate to have her on our faculty! Kudos to Idalia Moran at REL Washington Elementary School! I would like to thank Idalia Moran as she is a great crossing guard. She is always on time and always there for each student who crosses or at lunch. She is so helpful and funny. The kids love her! Thank you Mrs. Moran for going above and beyond to put a smile on the students' faces and making their day. Thank you for everything you do! Kudos to Martin J. Cruz at Rio Bravo Middle School! Thank you Mr. Cruz for your continued support and involvement in your kids education! It was a privilege to meet you and establish a relationship that will certainly have a positive effect on your child. Looking forward to a year full of excellence! Kudos to Augustin Cordorva III from Special Education! We would like to give a shout out to Agustin Cordova III for being such a perfect role model, not only for his family, but for his students and friends. We are so proud for all the work you do. Even when you are busy you are always willing to take on extra work. Keep up the fantastic work and continue to be the great model always. Kudos to Monica Bustillos at Parent Pupil Services! EKIS would like to recognize Monica Bustillos from Pupil and Parent Services for her support and assistance in helping two of our dynamic students find resolution within their lives, at school, and at home - through a proactive Restorative Chat session. EKIS and our community truly appreciates your Service Excellence! Kudos to Mr. Serna and the Custodians at Del Valle MS West! I would like to thank the custodians at Del Valle MS West for their outstanding job taking care of our school. Compared to one year ago, you'd have a hard time recognizing our classrooms as they now sparkle and shine beyond compare. I would especially like to thank Mr. Serna for getting my room ready and checking on me every morning. Thanks so much everyone! Keep up the excellent service! Kudos to Maria Gomez at Indian Ridge Middle School! Kudos to Maria Gomez, our Custodian, for always taking charge and have our school and our office smelling and looking very clean! We appreciate you Maria! Kudos to Dr. Sandra Calzada from Rio Bravo Middle School! On top of being a master of safety, innovation, and accountability, Dr. Calzada has excelled in the area of courtesy. Her ability to listen to her staff goes beyond a normal administrator. She models active listening, empathy, and it is evident that she listens not only logically, but with her heart. Thank you so much for being such a positive role model on campus. Kudos to Matthew Macias at Eastwood Middle School! Coach Macias has done an excellent job in planning and executing activities that couple his 3rd period Special Education Units with the general education classes. In addition, the activities planned give ALL our Special Education students the opportunity to participate in PE at some level. He truly has shown Service Excellence to his students in the form of Innovation. It truly warms my heart to see the students so eager and happy to participate in PE! We enjoyed the variety of food samples offered at the Child Nutrition Open House! The summer smoothie was awesome! It is great that our children are getting different alternatives!! And also meals @ 4 PM! Kudos to Rick Sapien at Rio Bravo Middle School! Mr. Sapien is not only helpful to students, but I witnessed Mr. Sapien help out a community member by walking a grandmother around to find her granddaughter. This was at 4:10 pm on a Friday when everyone is usually in a rush to leave. Thank you Mr. Sapien for taking the time to help the member of our community. View more Service Excellenc Kudos. Kudos to Mrs. Cynthia Mendoza at Tierra Del Sol Elementary School! KUDOS to Ms.Mendoza for coming out on Jurassic Park day in full T-Rex costume to pick up her students! She made all children gleam with joy and parents smile. It makes me proud to be a Tierra alumni and to see my son so happy to see his "T-rex maestra." Kudos to Jorge Lujan from Rio Bravo Middle School! A big Thank You to Mr. Lujan for expediting chrome books to ALL of our students by the end of the 2nd week of this school year. We truly appreciate your efforts! Kudos to Elizabeth Eck in Risk Management! I would like to thank Ms. Eck for everything you have done for me. Thank you for listening to me. I know you are a very busy lady but you never rushed me off. You have a very big heart, you are compassionate and kind and I will always remember that! Thank you! Kudos to Elementary Team in Division of Academics! EXCELLENT job on our Math Conference! Great information of new and innovating strategies to support math and science classrooms to drive student success. Kudos to Stephen Poblano from Rio Bravo Middle School! Coach Poblano is always available for all the students before and after school to further students academically and athletically. Coach Poblano thank you for being there for our RBMS students. Kudos to Claudia Martinez, parent at Rio Bravo Middle School! We are very fortunate to have such a great parent in our school. Claudia Martinez's children are exemplary and are always willing to push themselves to accomplish greatness. The reason why they are successful is because they have the support of their mother. Kudos to Mr. Francisco Sierra at REL Washington Elementary School! I would like to recognize an amazing 5th grade teacher, Mr. Sierra at REL Washington Elementary School. He always receives his students every morning with a smile and a positive attitude. Mr. Sierra is always willing to go out of his way to help his students to learn. He was the teacher of the year and very well deserved. All can say THANK YOU so much for being amazing teacher you did a huge impact in my son's life and always telling him to search for his goals in life. Kudos to Diane Seufert at Rio Bravo Middle School! Mrs. Seufert has been my survival during my first year teaching. She is not assigned as my mentor; however, she has gone above and beyond what I feel is her responsibility as a coach. She is an amazing person and kind at heart. Her love for education is so natural. Kudos to Mario Lucero, Central Office Curriculum Development! Mario always goes above and beyond in his efforts to serve the Social Studies learning goals and objectives! He's always got a smile and a handshake ready and is committed to helping the middle school teachers succeed in boosting our student performance in and out of the classroom. Kudos to Mr. Mauricio Cano at REL Washington Elementary School! Mr. Cano goes above and beyond to be there for students, parents and employees. He is a great principal and always has a great positive attitude welcoming the student and parents no matter the situation. My kids are super happy going to school everyday! We would like to thank Hope Gomez-Volunteer for her dedication and loyalty to BAHS. Her service on campus is greatly appreciated. Kudos to Pat Almeida, Counselor at Hanks High School! Thank you for all of your hard work and time you have put in helping with my daughter's schedule. I really appreciate it! Kudos to Riverside High School teachers, staff & community members! A special thank you to the Riverside High School Team who made the stadium renaming ceremonies a remarkable success. From the Thursday dinner to game day festivities, renaming Riverfront Stadium to Tom Work Riverfront Stadium was all class. Thank You SO MUCH! Sean and Jackie Nugent and the culinary art students at the Riverside Career Center, Arleen Garcia, Adriana Marquez and STUCO, Pedro Martinez, Sergio Ramirez, Richard Vilardell and the audio/video students at the Career Center, Joyce Frontz, Charlie de la Rosa and Jorge Acosta. Your efforts and dedication to RHS are appreciated and loved. GO RANGERS! Kudos to Izel Hernandez at Hanks High School! Very thankful and lucky to have staff as dedicated, service oriented, and resourceful as Izel Hernandez. She is always answering my questions, requests, and emails in a timely manner. Love the fact that she goes out of her way to resolve what comes her way, even when it's not part of her "job description." Very impressed with her sense of urgency. Keep up the good work, Go Knights! Kudos to Officer Jessica Ramirez from Central Office Security! Officer Jessica Ramirez, since day 1, has lent herself to be courteous, knowledgeable, diligent and above all helpful! Thank you for all your assistance. Kudos to Ms. Yaguirre at Dolphin Terrace Elementary School! She helped my son who was falling behind in school to succeed. She advocated for him and made sure he did not feel left out. Her honesty, patience, and hard work helped my son pass to the next grade level. Kudos to Mr. Enrique Herrera, Principal at Hanks High School! Mr. Herrera has changed the culture of Hanks in the few short months at the school. He is extremely involved , passionate, positive and disciplined. My son loves being at Hanks more than ever and a lot of this is due to his Servant Leadership! Kudos to Dana Ahedo, Home Liaison at Ysleta Pre-K! Ms. Ahedo is a great person. She always does everything for our volunteers. She is our voice and always lets everyone know what is done by volunteers. She always has huge volunteer groups, makes us feel welcomed and loved. We need more people like her. She is definitely serving excellence and she is amazing. Kudos to Cyrstal Tate, crossing guard at REL Washington ES! Cyrstal goes beyond for the kids to be safe in crossing. She directs traffic in front of the school and making sure parents pay attention to driving. She also works in the cafeteria and out at the playground monitoring the kids to be safe at all times. Kudos to Stephanie Rojas at Ysleta Pre-K! I would like to recognize Mrs. Rojas, teacher at Ysleta PreK, for her hard work with her students at such a young age. My 3 daughters were fortunate enough to have had her as a teacher when they were in pre-k. She truly laid the foundation that has helped them succeed in school at every level. Kudos to you, Mrs. Rojas, may you continue to enrich the lives of many more children to come and may you never lose that passion you have for teaching. Thank you! Kudos to Mesha Daniel from Innovative Learning Department! Thank you Mrs. Daniel for always being a call or text away and for coming out to the campus to support us in converting our devices. Kudos to Sylvia Gonzalez from Eastwood Middle School! I would like to acknowledge Coach Sylvia Gonzalez at Eastwood Middle School for supporting the athletics program on a yearly basis. Her compassion and dedication to the students participation in sports has made a difference at Eastwood Middle. I have had the pleasure of working with Coach Gonzalez over the years through the athletic physicals donations program that she developed. She is the hardest working coach I have ever met, and I admire and have the most utmost respect for her. Thank you Mr. Herrera for your excellent communication with parents and a great freshman orientation! We truly appreciate it. Kudos to Pat Gutierrez, Asst. Head Custodian at Bel Air High School! We would like to acknowledge and thank Pat Gutierrez for always going above and beyond his duties in fixing the air conditioners in the 400 hallway. Thanks to him the students and staff of the 400 hallway are cooler. Big Red Loyal Forever! Kudos to Jessica Ramirez in Security! Thank you Jessica Ramirez for your patience with reassignments of the access cards for the Hall Pass system. Your customer service and prompt solutions is very much appreciated. You are what makes The District the best because you serve not only our campuses but parents and students as well. Have a great day! Fili and Janeth did an awsome job converting the Datashark Wellness Activity log information into a 21st century, user friendly program. The reports are now available with a tap of a button. Kudos to EMS/EHS 9th grade office staff at Eastwood Middle School! EMS/EHS 9th grade office staff did a great job during registration week. Getting all our students enrolled in a timely manner and getting ready for the upcoming school year.Ya'll ROCK - have a fabulous year! Kudos to Frances Yepez at Facilities and Construction! Thank you Frances for all your help and continued dedication in resolving our cafeteria issues at Thomas Manor. You make our jobs less stressful. Kudos to Jesus Chavez and Warehouse staff! I have had the pleasure working with the warehouse peeps and knew I was blessed just knowing them. These are a group of people with big hearts, kindness, work ethics, I could go on and on. Jesus Chavez, thank you for your "glorious" voice in representing yourself and the warehouse in wishing me a happy birthday with song! Army and Albert you have one of the best group of people the district has and ya'll represent that so well! Again, thank you Jesus Chavez "con mucho carino!" Kudos to EMS/EHS 9th grade Administrative Team! What a great start to the 2018-2019 school year. Thank you for attending to all our parent needs and concerns and being present everyday during registration week. Welcome to Team One Eastwood! Kudos to Javier Omar Cruz at Del Valle High School! A HUGE thank you to custodian Javier Omar Cruz for going above and beyond in my library. The floors have never looked as good as they do now. Thank you! I appreciate your hard work! Kudos to Cristina Campos at CTE. I know I've thanked you already, but I wanted to say thank you "again" for being my HERO last week. You are the perfect choice for the CTE secretary. Kudos to National Honor Society and Ms. Bujanda at Riverside High School! Pebble Hills Elementary is proud and honored to celebrate an amazing group of remarkable Rangers from RHS. The Hills hosted students from the National Honor Society for the week of August 6-8. These outstanding leaders helped paint and prepare classrooms for our students. We know without a doubt that there is no way that we could have completed this mission to paint with your generous volunteering and commitment to give back to the community. Our Bobcats thank you, our pride of teachers and staff. With tears in my eyes...this administration Thanks You. Mr. Gurany, these students are superheroes and I am tremendously grateful. Thank you, sir! Kudos to PMS principal Mr. Javier Salgado and PMS staff! Thank you to the Administration Team and the Parkland Middle School TSA and Student Council Organizations for making all THE DISTRICT's Principals, Assistant Principals and Directors feel welcomed at your campus during our 2-day Leadership Retreat. Your hospitality and courtesy make not only THE PARK shine but OUR entire district. Wishing you continued success for 2018-19. Kudos to Erika, volunteer at Pebble Hills Elementary School! Thank you Erika for all of the time and effort you have put in to PHES as an awesome volunteer! You have made many displays for the gym and hallways all on your own, and/or with the help of your husband! The decorations have been, in my opinion, the best ever here at PHES! Your decorations made the Pre-K Graduations even more special, emphasizing their future as "Awaiting Knighthood!" Thank you very much for all you do for PHES! You are awesome! Kudos to Jessica Moreno in Budget. 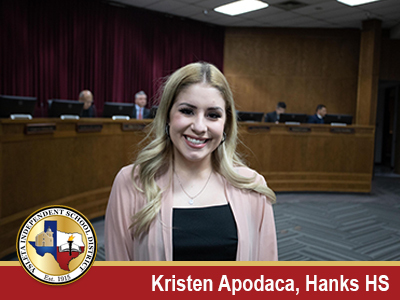 I've been the Hanks Budget Clerk for just over a year and I can't say I've learned it all, but Jessica Moreno has been instrumental in helping me find the answers to my budget questions. She will either teach me, guide me to get my answers or help me not to look totally ignorant to other employees. Thank you Jessica, especially with the CTE Summer accounting. You're gentle guidance makes me feel like I can do this job well! You are the best! You're my Hero! Kudos to Jose Soto in TIS! Kudos to Jose for helping out with a computer/vendor issue we were having. He went above and beyond to help out, even while working away from the office! Way to deliver service excellence! Kudos to Gregory Longstreth from Del Valle High School! Thank you for always helping out with a smile. Our campus is truly blessed to have you! Kudos to the YISD Board of Trustees! Kudos to our Board of Trustees for being named Best in the Region! Now others will know what all District employees believe, that YISD sets the standards and pursues excellence and it begins with the Leadership! Kudos to Mario Flores in Maintenance/Plumbing! It is summer, custodians are off, my registrar and I are rearranging furniture and had an extremely large cabinet that needed to be moved. Mr. Flores was here to fix a plumbing problem, when I asked for his help, he jumped right in! Talk about your "TEAM YSLETA!" He certainly did not need to help us but he did. Thank you Mario, Edgemere office ladies appreciate you! Kudos to Ms. Haydee Duran at Mesa Vista Elementary School! I would like to thank and recognize Ms. Duran for her help and support with summer school students. She has been very proactive with helping out with issues on our bus. She truly believes that it is a team effort between transportation and the schools staff to be able to suceed with our students. Thank you Ms. Duran! Kudos to Administration and Custodial Staff at Eastwood Middle School! Thank you for all your assistance with our CSI field trip. You are a great example of Service Excellence and made it possible for 560 summer school students to learn from their law enforcement heroes. Kudos to Mr. Gaytan and grounds crew! Thank you Mr. Gaytan for helping RMS look amazing. We are grateful for your efforts on beautifying our campus. You guys are an awesome group! Kudos to EHS and RHS Student Council Teams and Chick-Fil-A! We are grateful to Eastwood HS & Riverside HS Student Council teams, Chick-Fil-A, Ashley Oropeza, Karina, Victoria and Adriana Marquez for your year-long community service project which provided a field day and running shoes to every student at Ramona Elementary. Our students will put them to great use! Kudos to Bel Air High School Clerks! BAHS Clerks: Thank you for your amazing dedication and "Loyal Forever" attitude to Bel Air H.S. Throughout the years you have been diligent in your tasks and have gone above and beyond with extra duties. Please, know that you are amazing women and I am forever grateful to work alongside you and am proud to call ya'll co-workers! Kudos to Mrs. Ochoa at Hacienda Heights Elementary School! Thank you for everything that you do at Hacienda Heights. The phrase is simple and the words are few, but behind them is a lot of appreciation. Thank you! Kudos to Custodial Staff at Bel Air High School! I would like to thank the custodial staff at BAHS. Their hard work in preparation for the demolition of the Dibler Gym (tear down, moving teachers, etc.) and taking care of the facilities and staff has been exemplary. Kudos to Mr. Ramos and volunteers at Desertaire Elementary! Thanks to our librarian Mr. Ramos and the volunteers who worked many hours setting up, running, decorating, and tearing down our buy one get one free book fair. The kids and the teachers really loved the great deals on Scholastic books. Many thanks. Kudos to Mrs. Hinojosa, Loma Terrace ES Principal! Thank you for all your hard work and dedication to Loma Terrace! Your positive leadership has not gone unnoticed. Thank you once again. Kudos to Communities In Schools of El Paso at Eastwood Knolls International School! I would like to thank all of our EKIS PTA and EKIS Volunteers. Thank you for an outstanding year. With your help our students were able to celebrate many activities and acknowledge their accomplishments. Our school has been blessed with very dedicated people that are always there when we need extra help. Your dedication in assuring that our students get the recognition that they deserve. Your hard work is deeply appreciated. I am blessed to work along with such marvelous people. Thank you for an awesome year! View more Service Excllence Kudos. Kudos to Mr. Eric Dominguez; Mrs. Romero-Carrera and Ms. Tovar from Tejas School of Choice! Congratulations to our STAAR testers and their AWESOME teachers! Biology, under Mr. Dominguez, passed at 100%; Algebra, under Mrs. Romero-Carrera, passed at 100%; and U.S. History, under Ms. Tovar, passed at 89%! Outstanding job in preparing our students in their subject area and supporting them in believing they could achieve! We are Tejas proud and strong! Kudos to Mike Williams, Director of Athletics! A BIG thank you to Mike for always helping the purchasing department with Facility Rental reservation issues. You are a team player! Kudos to Coach Oscar Melendez from Dolphin Terrace Elementary School! I would like to give the biggest shout out to our amazing Coach Melendez. He organized the 1st Annual Parkland Area Elementary Future Matador Track Meet. The event was held at Parkland High School with participants from North Star, Desertaire, Parkland Elem., and Dolphin Terrace. Thank you Coach Melendez for always going the extra mile for not only our students but for all the students in our area. Kudos to Julianne Baquera at Ysleta High School! Congratulations for being selected by faculty as 2018 Ysleta High School Maiden. Kudos to Volunteers at Edgemere Elementary School! I would like to thank our volunteers at Edgemere Elementary. They are just wonderful . Everything they do is transformed into magic. They can turn our gym into Paris, Hollywood Academy Awards and the magical Kingdom of OZ. Everything they do is with a kind heart and without expecting anything in return. Edgemere is very blessed to have such special angels in our campus. Thank you ladies. Kudos to Cedar Grove ES parent volunteers! Cedar Grove ES parent volunteers are the best! From helping with school decorations, to dancing for pep rallies and cooking to honor our teachers, they help in every way possible and always with a smile. We are forever grateful to you! Thank you for taking such an active role and volunteering your time towards helping our students! We couldn't do it without you. Kudos to Erica Nash, Instructional Coach! Thank you Erica for all of your help and support with testing. You are a dynamic leader and you make sure schedules are set and students are always accounted for when it comes to interventions and blitzing groups. I truly appreciate all of your help when it comes to taking care of the stressful details. You rock! Kudos to Edgemere Double Dutch team and parents! I would like to congratulate the Edgemere Double Dutch Team! You all did an amazing job at the P.E. Demonstration Day! Thank you team and parents for your commitment and support! Kudos to Dolphin Terrace ES family! Just want to thank my Dolphin Terrace family for your great show of love and support in my being named Support Employee of the Year. It is an honor to represent my campus and the support personnel of YISD! Kudos to Ms. J. McMillan at Sageland Elementary School! Ms. McMillan, we would like to take this time to Thank You very much for being a very kind, patient and caring teacher who teaches from the heart. We appreciate you and your qualities and everything you do for all the children you teach in second grade, especially for our daughter Desiree Hope Gomez. Kudos to Mrs. Gracie Varela and Ms. Linda Loera from Edgemere ES! The end of the school year is approaching and I would like to thank Mrs. Gracie Varela and Ms. Linda Loera for their love of their students, commitment and dedication to their job. It has been a challenging year for us, but when you work with people like them it makes it all worth while. The challenge turned into a success for the students and us. I can not find the words to express my gratitude to them. They are gems and I enjoyed working with them. Kudos to Rosa Celaya in Purchasing! Thank you for going the extra mile to obtain the vendor registration for the APSI institute at FIU. Kudos to Coach Armendariz and Coach Mendez at Edgemere Elementary School! Great job coaches at the P.E. Demonstration! The double dutch team looked awesome and my daughter had such a wonderful time all season! Keep up the good work! Kudos to THEDISTRICT Public Relations team! Great job to the Public Relations team for an awesome Teacher and Support Employee of the Year Gala! It couldn't happen without your creativity, dedication and hard work! Kudos to Edgemere Principal Mr. Perez and Coaches! I attended the P.E Demo on Saturday at Del Valle High School. Kudos to the program, theme and music. I loved it! I loved the performance of all the students and the shirts they were wearing. Continue with your excellent care and with all that you are doing with the students. Thank you, and you all rock at Edgemere Elementary! Kudos to Bus 219 Driver Elfido Camarena and Attendant Jesse Gonzalez! Our bus driver and bus monitor are the best! Thank you for the care and respect you give to our students. Every day they see you smiling and ready to start the day, it makes a big difference! Kudos to Javier Salgado at Parkland Middle School! Thank you for the care, respect, and attention you give to the students at Parkland Middle. The atmosphere in school is very positive. It starts with the ladies in the front office and the teachers & staff keep it moving throughout the day. Kudos for being a great leader! Kudos to bus drivers Erick, Angel, and Jesus in Transportation! You rock! Congratulations for winning the Region 19 Bus 'Roadeo' competition! You proved Ysleta ISD has the best drivers in the Region. Erick Sanchez, 1st place Transit Bus. Angel Mata, 1st place Conventional (regular yellow) bus. Jesus Araiza, 2nd place Conventional (regular yellow) bus. Ysleta ISD Transportation is #1. Go Team! Kudos to Academic UIL: Biillye Lucas, Adam Ulloa, Francisco Velez, Rachel Mullins, Elizabeth Zelenak, and all the other volunteers! Thank you for the great experience with the Academic UIL competition on Saturday. Your hard work and dedication definitely showed throughout the entire day! We appreciate your continuous support with this event. All of you are great examples of Service Excellence for our District! Kudos to 21st Century Program at Indian Ridge MS! I would like to congratulate every student who completed the 45 days or more attending the program. A special thanks to school administration for their support. And lastly, to all the tutors who daily encourage students to keep coming to the program. Kudos to Bel Air HS Boys Varsity Baseball Team! Much appreciation to the Boys Varsity Baseball Team for showing up at Del Valle High to support our Bel Air student's who participated in the basketball Special Olympics. As a parent of one of those students, I became teary eyed to see such a wonderful gesture. Kudos to Mrs. Roman at Bel Air High School! Thank you Mrs. Roman at Bel Air High School for doing a great job with the Special Olympics Basketball Team. The student's had so much fun. Thank you for having such a caring heart. Kudos to Naomi Santacruz at Bel Air High School attendance! Huge kudos to Naomi Santacruz who is very efficient and gets things done! Most importantly, she does it all with a smile. Thank you for your awesome customer service, Naomi! Kudos to JoAnn Kirk, couselor at Desert View Middle School! Thank you Ms. JoAnn Kirk! Everyday I watch you counsel so many of our students individually, while being in charge of Friends of Rachel, Student Council, and the new Environmental Club. You are always very busy, yet you still find time to talk to teachers and work with large groups of students in each classroom. You are awesome! Kudos to Ida Arenas, Bel Air HS attendance office! I know you are overwhelmed with work but you always have a smile on your face! Thank you for all that you do! Kudos to Mrs. Garcia, Attendance Officer at Indian Ridge MS! A big thank you to Mrs. Garcia for taking the time to go step by step with me on the registration process. Thank you from the bottom of my heart. Kudos to Pasodale ES Volunteers! Happy Volunteer Week to our amazing volunteers. Thank you for all you do at our campus. Every day our volunteers rock it over 16,000 hours for the 2017-2018 school year! Proud Mustang community. Kudos to Administration & Office Staff at Pebble Hills Elementary School! Kudos to Jorge Reyes, AP at Dolphin Terrace Elementary School! Thank You Mr. Reyes for adding your special skills, gifts, and talents to the Dolphin Terrace Family! You are a joy to work with and all that you do is appreciated! Kudos to Scotsdale Elementary School Volunteers! Thank you to all of our volunteers! Your dedication and hard work is greatly appreciated. Happy Volunteer's Week-we couldn't do it without you! Kudos to Arleen G. at Riverside High School! You rock Arlene! I know I can depend on you to help clear an issue no matter how busy things are for you at the campus! I appreciate you. Kudos to Claudia Martinez and Sergio Pineda at Innovative Learning/Library Services! A big shout out to Claudia Martinez and Sergio Pineda for working behind the scenes to ensure that our YISD librarians have all the reports, uploads, and original cataloging they need to get the job done well! Thank you for your great customer service! Happy National Library Week to the entire YISD library family! Thank you for providing exceptional service to your learning community, for being literacy and technology leaders, and for instilling a love of reading in your students! Know that your hard work and dedication to everyone you serve is truly appreciated! Kudos to Math and Reading Instructional Coaches at Sageland Elementary! I want to give big Kudos to our instructional coaches, Mrs. Gaby Guzman-Lopez and Mrs. Amber Villanueva. They really went above an beyond into planning our STAAR blitz and our review camps for 5th grade. Thank you from the bottom of my heart for helping our grade level and the students really enjoyed the camps. They can't wait for the science blitz and camp. Great job ladies! Kudos to Purchasing, Accounting, and Budget at Central Office! I can only express "Thank you" with deep gratitude! I cannot do my job (as well as I do) without the guidance and direction of these departments and the people (you know who you are) within them. You're a great foundation for all of us and the district who look to you for guidance and knowledge. Stay blessed. Kudos to Jessica Yildirim from Young Women's Leadership Academy! Congratulations to Ms. Yildirim and the seven girls who participated at the Texas Science Fair Competition. Ms.Yildirim's hard work and dedication to Science paid off as the girls represented YWLA and YISD with pride and confidence! Kudos to Keith Murray in Grounds Department! Thank you for going above and beyond when you think no one is noticing. The pride you show in your work is a shining example to all of us. Thank you from the entire Edgemere Elementary community. We are proud to count you as part of our family. Kudos to Ms. Soto, counselor at Dolphin Terrace ES! Thank you for all your hard work in putting together a successful Career Day for our students! The presenters really engaged the groups and sparked an interest in the various careers that are available. Your efforts were appreciated! Kudos to Isaac Baeza from Pebble Hills ES! Thank you Mr. Baeza for helping our school out with the Robotics kits. Thanks to your help our team was able to get started and we greatly appreciate you! Our team learned what helping others looks like from your example. 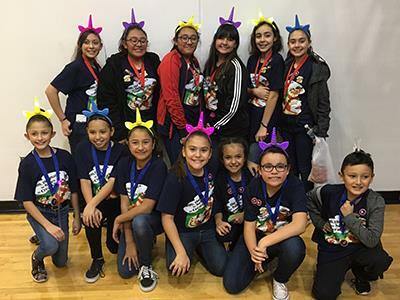 Kudos to Del Valle Elementary Science Camp Team! I would like to recognize Ms. A. Lucero, Ms. K. Bazan, Ms. A. Del Toro, Mr. V. Montes and Ms. O. Cerecerez for making our Saturday Science Camps a great experience for our students! Your dedication and commitment to serving all of our students does not go unnoticed! Thank you! Kudos to Valerie Chavez from Cedar Grove ES! Mrs. Chavez is very proud of the position she hold as Math/Science Instructional coach here at Cedar Grove. She is always looking on the positive side of things and is always willing to help. She stays late to tutor during the week and she comes in on Saturdays to tutor Saturday school. Her lab is always ready to go and she treats everybody with respect. She has become this campus' Twitter Queen and has the best interest at heart for Cedar Grove Elementary! Kudos to Shawn Leggett from Camino Real MS! One of the best librarians in the city. I don't even think my child would be able to read without his assistance. Shout Out! Kudos to Veronica Flores-Simental from Cedar Grove ES! Welcome to our family, Ms. Flores-Simental! Thank you for all of your help with the multiple activities that take place in our school. You are a fast learner and highly dependable! We love having you in our school. Kudos to Jeremy Charo from Valley View MS! Mr. Charo goes out of his way to make students feel welcome in his classroom. He is a model educator. Kudos to Mrs. Quinones at Del Valle Elementary School! A big thank you for everything that you do for the students at Del Valle. From morning greetings, to Saturday calls, to following up with any questions or concerns we may have. You are an extraordinary role model for our children and we are blessed to have you as our children's Assistant Principal! Kudos to 5th grade teacher Ms. Kara Flaggert at Cedar Grove Elementary School! Mrs. Flaggert transformed a potential discipline issue into a creative learning opportunity for her students. As a result, her students engaged in a hands-on mini project and practiced their problem solving and collaborative skills. Way to go, Ms. Flaggert! One more example of your awesomeness as a part of our Cedar Grove ES Family. Kudos to Miguel Villalpando from Del Valle High School! Miguel deserves to be recognized because another student waiting for the bus (at another bus stop) started to feel dizzy and then collapsed. Miguel quickly dialed 911 to call for EMS. I am a neighborhood citizen and I can confirm this happened. Kudos to Michael Martinez at Plato Academy! Thank you Mr. Martinez for being an advocate for the students at Plato Academy. Your dedication, tenacity and persistence is greatly appreciated. Your integrity, passion and work ethic is noticed and admired by this community of learners. Keep up the great work! Kudos to Mini Troopers Julian Torres, Emily Valdez, Layla Falcon! We would like to congratulate the Mini Troopers for all your hard work and dedication on your robot and research paper. You guys did awesome at the VEX IQ competition. They were awarded the Excellence Award and Teamwork Champion Award for 2017-2018. Good Luck at World Competition in Louisville, Kentucky, have fun and try your best! Kudos to Kenneth Hix, Jose Vasquez and Jorge Levario at Plato Academy! Kudos to Social Studies teachers Kenneth Hix and Jose Vasquez, in collaboration with Jorge Levario, for developing "PLATO LIVE! "; our independent, 24/7 database which affords students access to digital textbooks, videos, and study materials. Gentlemen, you are 'game-changers' at the Academy and we appreciate your dedication to our students. Kudos to Mr. Jerry Shaffer, Bel Air High School Boys Track Coach! Thank you to running coach Coach Shaffer for recovering my son Victor's backpack after a track meet at Bel Air HS. Coach Shaffer not only safeguarded the backpack, but also went out of his way to deliver it to Victor's coachs' residence that same evening! Victor and I want to acknowledge Coach Shaffer for his actions. I am personally donating $250.00 to the Bel Air boys track team in appreciation as to what has transpired. We are beyond grateful. Thank you Coach Shaffer. Kudos to Yamira N. Galicia at J. M. Hanks High School Cafeteria! Yamira, you have gone above and beyond when four cafeteria staff members were out and Yamira offered to help serve lunch. Thank you so much for being there when we needed the help. Ready to assist with a smile and a positive attitude. Thank you so much for being there! Kudos to Jose E. Soto in TIS! Jose is very knowledgeable and helpful and has never said "no, or I can't do it right now." Thank you Jose for going the extra mile for all of us. You are much appreciated. Kudos to Corina in Transportation! I would like to recognize Corina, our dispatcher, for the outstanding job she did during an emergency situation. She remained cool, calm, and collected to ensure the safety of our students. Well done! Kudos to Jeremy Little, Micro Computer Tech! Jeremy is very nice and always willing to help. He always has a smile and is very pleasant and knowledgeable. Thank you Jeremy. Kudos to Officer Montoya at Bel Air HIgh School! Thank you so much Officer Montoya for going above and beyond to ensure the safety of our students during lunch time. You prevented a situation from escalating as soon as the student advised you of it. Keep up your hard work and dedication! Kudos to Morgan Pena at Del Valle High School! Ms. Pena works hard everyday with the students and teachers/staff to create a solution for every problem in her Bio Class. Kudos to Charles E. Garcia, principal at Bel Air High School! Your strength, understanding, energy, endurance, knowledge, forgiveness and truth gives BAHS "purpose." Continue to speak in victory. Great things are happening with you at the helm. A shout out to your AP's also. Thank ya'll for everything you are doing for the kids! Kudos to Trileina Rubio from East Point Elementary School! Congratulations Support Person of the Year! Thank you being a great part of the team here at East Point and always putting our students first. It is a pleasure to work with you! Kudos to Wanda in Payroll! Shout out to Wanda in Rayroll. Thank you for being curious and making contact with me. We all should get to know one another. Kudos to Robert H. and Lulu in TIS/Network Services! These two did a great job in helping us when we had technical issues. The kept troubleshooting until they were able to resolve it. Thank you both! Kudos to Attendance Office at Bel Air High School! Liza, Araceli, Ida, and Neomi, what a great job you are doing. Remain strong and diligent in your positive ways. Keep "GRACE" at your side. You've got this! Kudos to Amy Perez in Human Resources! Thank you Amy for your dedication to answering all questions that are asked and going above and beyond with information asked! Kudos to Lorena Olmos in TIS! Thank you for keeping us on track with our webpages Lorena. Your words are always kind and supportive. Thank you for all you do! Kudos to Liz, Maria, and Isaac at Del Valle Elementary - SPED Rsources! Kudos to Paul Solis at Del Valle High School! I would like to recognize Mr. Solis a Law Enforcement/Fire Tech Teacher. My son was put in a Principles of Law, Public Safety, Corrections Class at DVHS and I thank Mr. Solis for teaching what he learned from his career. Kudos to Sonia Padilla in TIS! Thank you Ms. Sonia for always being available to help and always having a solution! You rock! Kudos to Central Office personnell! Thank you to all personnel that came to our campus and helped in our time of need. With special thanks to Dr. De la Torre, the Cabinet and Ms. Menchaca for your support. Thank you! Kudos to Del Valle Learning Community! With appreciation for your willingness to help our campus in the time of need. With special thanks to Mr. Acuna and Mr.Gamez at DVHS, Ms.Garcia at CRMS and all the Del Valle Area Principals. One Family One Destiny. I just wanted to thank a very friendly and kind bus driver, Tony. He always has a big smile and great attitude towards parents and students. The students are very happy to have an awesome bus driver as him. Thanks a million for all you do. Kudos to cafeteria staff at Scotsdale Elementary School! Congratulations to the cafeteria staff at Scotsdale Elementary for innovation and providing service excellence to the students and staff. Kudos to Marta Amador in Transportation! Our bus driver, Marta Amador, retired today. I just want to let her and YISD know what a fantastic person and employee she is. For years she was dedicated to being patient, caring, responsible, and professional. I feel blessed that my boys were in her care. Thank you for everything Marta. You will truly be missed. Kudos to Debbie Herrera from Presa Elementary! A big thank you to Debbie Herrera, Secretary at Presa ES. She went above and beyond to ensure that the students at Presa ES continued on with all planned activities in the absence of the school counselor. Thank you so much. Kudos to Albert Macias at the Warehouse! A big Thank You to Albert and his warehouse staff members for always going the extra mile for Ysleta Pre-K! You are an example of servicing EXCELLENCE! Thank you again! Kudos to Erica Esparza, Plato Academy clerk! Erica goes the extra mile to ensure Plato Academy students are afforded timely, accurate, and relevant information which will assist them in their academic pursuits. An alumni of Plato, Erica serves as a role model to students who have endured life challenges. A valued employee, Erica exemplifies the PLATO spirit of success. Kudos to Teachers & Paraprofessionals at Young Women's Leadership Academy! Thank you to our wonderful teachers and paraprofessionals for going above and beyond everyday for our girls and the school! All of of you are a true blessing to the school and district! Kudos to Jennifer Delgadillo from Accounting! Congratulations on being inducted to the El Paso Golf Hall of Fame. Your dedication, enthusiasm and insight inspire us all. Great job! Kudos to Ms. Acosta, counselor at Eastwood Knolls International School! Ms. Acosta,thank you for going above and beyond for your students. We could not thank you enough for helping us with the application process. You are the best! Kudos to Lorraine Villalobos in Accounting! Lorraine is one of the friendliest people we have as a cashier. She always tells them to have a great day and if the person is in the military, she thanks them for their service. Everyone who encounters her leaves with a smile. View more Service Exellence Kudos. Kudos to Mrs. Elizabeth Lara at Pebble Hills Elementary School! Kudos to Mrs. Lara for demonstrating kindness to military soldiers by sending student letters and care packages to deployed soldiers. You have gone above and beyond in your Service Excellence and promoted the Random Acts of Kindness district initiative. With your support, over 2 million care packages were sent on December 2017. Thank you for making a difference! Kudos to Laura Lara in Accounting! She always goes out of her way to help others. While the person for student records was out, she helped a parent try to get a copy of her personal ID. Laura called several schools to find out if they had a copy of it along with her child's records. Kudos to Lloyd Fulkerson at Bel Air HS! Thank you for always 'opening the door' with a smile. Your positive attitude is very welcoming. Kudos to Bel Air High School cafeteria! I would like to thank the cafeteria for all they do for our students, like preparing delicious lunches to having sack lunches for our testing days (sometimes at the last minute) but they still come through. Thanks for caring for our students and staff. Thanks again. Kudos to Liz and Jessica at Eastwood High School! Kudos to Ms. Rosie Silva and Ms. Daisy Perez, BAHS Go Center! We would like to congratulate these hard working individuals for guiding our students in applying and obtaining scholarships that will assist them financially beyond Bel Air! GO BIG RED! Kudos to all campus and department secretaries! Thank you for everything you all do for all of us, always there with a smile and ready to assist in anything. Thank you so much for being there! Kudos to Aaron Caplinger at TIS-Network Services! Aaron has responded to every Ramona Elementary request immediately. He researches & stays until the concern is resolved and follows up personally. He is proactive in setting up systems that will prevent future technology issues. When we think of Service Excellence, we think of Aaron. Kudos to Mrs. Cano's 6th grade ESL 1 class at Indian Ridge MS! I want to congratulate Mrs. Cano and her 6th grade ESL I class for winning the Read to Succeed Challenge through the Achieve 3000 program! This challenge is school-wide, state-wide, and world-wide. This acknowledgement is due to their hard work and diligence as scholars. Your hard work has not gone unnoticed. We are so proud of you! Kudos to Dolphin Terrace ES! Thank you Dolphin Terrace Elementary School for hosting the ADHD academy for the entire Parkland feeder pattern. Your office staff was exceptional as they greeted every parent with a smile. Thank you Principal Martinez, Assistant Principal Reyes, Ms. Quintana, and Mr. V. for all your assistance and support. Kudos to administration and staff at Pebble Hills ES! I would like to give Kudos to administration and faculty /staff at Pebble Hills for giving me an amazing warm welcome on my first day at the campus. I'm excited to be part of this new team. Thank you! Kudos to Dr. Octavio Sanchez at Bel Air HS! Dr. Sanchez goes above and beyond. I have had the pleasure of working with him with my oldest daughter and now with my youngest. His kindness and compassion is amazing! Thank you so much for all your caring and help! Kudos to Ralph Espindola and Jesus Chavez at Warehouse! A BIG "Thank you" to Ralph and Jesus for going above and beyond. They came out to central office to help the Payroll Dept. assemble some items. We appreciate your awesomeness! Kudos to Parkland High School football coaches! I just wanted to point out that the Parkland football coaches have done an outstanding job for the past two season. Thank you for helping our sons to learn the game of football and life. Kudos to Greg Longstreth, ITS at Del Valle HS! Kudos to Mr. Reyes and Ms. Fran at North Star Elementary! Thank you for everything that you do. It is and always has been very much appreciated. Your dedication, enthusiasm, outstanding care, creativity, and professionalism is every parent's dream for their child to have as role models in the classroom. You both deserve 100,000 kudos! Kudos to Aaron Gomez in TIS! Aaron has done an AMAZING job getting all the computers in the dome at Hanks working properly. We really appreciate all his time and hard work! Thanks Aaron! Kudos to Ysleta ISD nurses! Good job to all the dedicated health care professionals who care for our kids everyday. The nurses of the district are committed to the health and safety of every child enrolled in our district. Everyday they make it possible for our children with special needs to receive the services they need. Kudos to Bel Air High School administration! The Speech and Debate Community and Eastwood High School appreciate your hospitality! Thank you for allowing Ft. Eastwood to host our speech and debate tournament at your campus! You are the best! Kudos to Jesse, Sandy & Marta in Transportation! I am very grateful for these three women: bus monitor Jesse and bus drivers Sandy and Marta. They exemplify the kind of people people we all want watching out for our children. The professionalism and the care they provide is above and beyond. THANK YOU, LADIES! Kudos to Lore Arellano, Budget Clerk at Bel Air HS! For always having a smile on her face and for always doing a great job at her campus, not only is she a great employee, but she goes far and beyond to meet every expectation for her boss and peers. GREAT JOB LORE! I appreciate you as a person and as an employee. You are a great asset to our community in general. Kudos to Ms. Rincon and cafeteria personnel at Dolphin Terrace ES! What a wonderful Thanksgiving meal the cafeteria provided for the families and student body! You always make the dining experience so pleasant with all the decorations and great service (of course the food was on point). I am thankful to work with such wonderful and caring people. Kudos to Isaac Dixon and Edward Rojas from Instructional Technology Department! Hats off to these guys who never shy away from any job and they always do grade 'A' work saving THE DISTRICT lots of money and time with their service and attitude. From all of us....THANK YOU! Kudos to Food Service at Dolphin Terrace ES! A heartfelt thank you to Ms. Lydia and the entire Dolphin Terrace cafeteria team for a beautiful Thanksgiving meal served with LOVE in an atmosphere of fun family dining! Kudos to Monica Lopez at Hanks High School! Great job, Ms. Monica Lopez! Hanksgiving was successful in feeding over 500 families once again. With the help of many schools, including those within the Knights Kingdom, and from without, Ms. Lopez brought happiness to many in need. Kudos to Lulu Govea at TIS Help Desk! Thank you Lulu for going above and beyond your duties, always willing to help. You are a great team player and we really appreciate you! Kudos to Aaron Lopez at Plato Academy! Senior Aaron Lopez is an excellent example of perseverance, determination, and dedication. Aaron walks four miles to and from campus daily in pursuit of graduation. A scholar and a positive role model to fellow students, his goal is to enter military service upon graduation. He exemplifies PLATO's spirit of accomplishment! I would like to send a huge THANK YOU out to YISD Transportation for not only their assistance in locating an item of my daughter's, but for their kindness, professionalism and courtesy. Though I don't recall individual names, I realize that these individuals go above and beyond what most people do each day. They rise early and take care of the most precious people in our lives. Simply put, thank you. Thank you for the wonderful Veterans Day Celebration complete with all the patriotic songs, music, and support to remind us all of the great sacrifices of our men and women in uniform. Kudos to Gerardo at Central Office Culinary Arts! Kudos to Gerardo and all the staff for an excellent meal. Turkey lunch with all the fixings were delicious. Thanks for making all my 10 orders and providing excellent service with a smile. Kudos to April Cabrera at BAHS Book Room! I would like April Cabrera to know that she is doing an amazing job at juggling the Book Room, other duties as assigned and now the copy machines for the campus! Great team work! Kudos to YISD Central Office event Dia de los Muertos participants! A huge shout out to YISD Central office for the celebrating Dia de los Muertos with such beautiful, informative altars. It has become a tradition for my family to visit central office in the month of November to view the amazing work the participants display. Kudos to Sergio Martinez at Riverside CT! Thank you Mr. Martinez for always being so quick to respond to our computer issues. You're awesome! Kudos to Ysleta High School Marching Band! A big Thank You to the Ysleta High School Marching Band. You all were by far the most outstanding hosts from our district (out of those that we visited) for the Eastlake Marching Band. Great sportsmanship :) Superior show of manners :) ONCE AN INDIAN ALWAYS AN INDIAN. Kudos to Dr. Heather Cuellar, Assistant Principal at IRMS! Dr. Cuellar, Assistant Principal has been on this campus for 3 months and she has been great! She respects staff, custodial and security like no other. We thank you for being patient, understanding and a great team player. Kudos to administration, nurse, and 8th grade teachers at Eastwood Knolls International School! Kudos to the students and faculty at Valle Verde Early College HS! The students and faculty were amazing and showed outstanding community service excellence at their fall festival on Halloween. The time and wonderful manners these young individuals showed towards parents and little kids was outstanding. Outstanding representation of THEDISTRICT! Kudos to Parkland Pre-K teachers and teacher assistants! The Parkland Pre-K teachers and teacher assistants did an outstanding job of completing the CLI testing! They were patient, positive and worked as a team to get the job done with excellence! Kudos to Debbie Vega and Rebecca Salazar at Edgemere Elementary! Our instructional coaches always go above and beyond for our teachers and students on our campus. They do an awesome job providing excellence! Thank you ladies for all your hard work and dedication! Kudos to Wanda Carrillo in Payroll! Thank you Wanda Carrillo for going above and beyond always willing to help with all my questions. You are very knowledgeable! Kudos to Sandra Valdez at Thomas Manor ES! On behalf ELAR Elementary Team, I would like to recognize the efforts of the entire faculty and staff of Thomas Manor for going above and beyond during a recent training. It was a very well coordinated effort of the principal, Ms. Sandra Valdez and her amazing leadership team to make sure parking was available and that teachers felt comfortable on a very hot day. Thank you for exemplifying SERVICE EXCELLENCE! Kudos to Jose Soto in Technology Information Services (TIS)! Infinity kudos to Jose Soto. This gentleman goes above and beyond to demonstrate what "Service Excellence" should mean and demonstrates it. He's the poster person. Which includes a smile and a side order of jokes. He's always ready to help anyone who walks in the door of TIS. Great Kick-Off for Red Ribbon Week and what a showing with the Parkland High School participants!! You always plan exciting and inclusive activities that allow us to shine, thank you. Kudos to Coach Ballesteros from Del Valle ES! Thank You Coach for always being very supportive and going the extra mile! A lot of things would not be possible if it weren't for you. Thanks! Kudos to Eastwood Knolls International adminstrators, teachers, and PTA/volunteers! Thank you so much for the awesome Dragon Fiesta! It was wonderful to see everyone come together as a team and put such a great event together for the kids and the community! Go Dragons! Kudos to Del Valle ES cafeteria team! Thank you girls for bringing science into the kitchen and giving our students the opportunity to see it in action! This is what teamwork is all about! Thanks! Kudos to Ms. Roxanne Merfa, principal at Parkland Elementary! With all the admiration and respect, we want to thank our school principal for all your support and dedication to the students, staff and towards us. You deserve the best. God bless you. Kudos to Irene Medlin and Darlene Solis at Ramona Elementary School! We would like to recognize Mrs. Medlin and Ms. Solis at Ramona Elementary for their professionalism, dedication and excellence in everything they do. Thank you for all your support. The cafeteria staff is blessed to have you beautiful ladies. Kudos to Mr. Robert Martinez, principal at Eastwood Knolls International School! Mr. Martinez is an outstanding and hard-working principal who always puts children first! His consistency in making himself visible every morning and after school making sure students are safe! He is welcoming and addressing everyday issues with sincerity and caring of what is best for students to succeed and be safe! Kudos to Mr. Jose Perez, principal at Edgemere ES! I would like to thank Mr. Perez for all the support this year by providing the P.E. department with new equipment. The coaches appreciate it and the students will love it. Kudos to Cynthia Lozano and Brenda Macias at Central Office/Desertaire ES! Mrs. Cynthia Lozano was very patient communicating through emails and finally on facetime. She walked me and Brenda Macias through the correct process in getting me and my co-worker Mrs. Mizcles into the right Goggle Classroom (all the while being under the weather!). Thank you to Brenda Macias for multitasking, while having to help out the Health Benefits representatives she was also making sure Mrs. Mizcles and I got the help we needed to complete the uploading of our videos. Kudos to Robert Torres in TIS! Mr. Torres has always been very respectful, courteous and helpful with all the issues of students logging into their computers this year. He's always quick to help and resolve our problems in a timely manner. Thank you Mr. Torres! Kudos to Victor Sanchez at Hanks HS! I would like to recognize Victor Sanchez for working hard every day and looking for the best in everyone. He is also a star student athlete. Kudos to Mrs. Navarrette 4th and Mrs. Sanchez 2nd at Eastwood Heights ES! For your hard work, patience, and compassion in helping our kids transition into their new school. Thank you! Kudos to P. E. Coaches at Alicia R. Chacon Int'l School! Great job on Catch Night! Thank you for inviting parents to join their kids to learn about healthy eating and exercise habits. My kids and I had a lot of fun. And I know many other families did too. Keep up the great work! Kudos to Ester Brito at Del Valle ES! Thank you for EVERYTHING that you do for the staff, the kids, and the parents! From clean ups to consoling students, you do it all! You rock! Kudos to Scotsdale ES Volunteers! The Scotsdale Volunteers do an amazing job! They are organized, friendly, and always there to help with anything! Thank you so much for all you do for our students and school! Kudos to Esther Gray from Del Valle ES! Esther thank you for always going above and beyond your duties. You always help without hesitation and it doesn't go unnoticed! You rock! Kudos to Lourdes Hinojosa, Principal at Loma Terrace ES! We would like to recognize Mrs. Hinojosa for her hard work and amazing dedication to the SSALT units. On behalf of our team, we want to say THANK YOU for all that you do! Kudos to Mercedes Carrillo at Eastwood Middle School! My latest assignment requires me to travel to three different campuses to interview students. Unfortunately, since I am unfamiliar with many personnel, I've been unable to make direct contact with them. Fortunately, Mercedes was able to make the contact and deliver my documents. Thank you Mercedes, for your excellence! Kudos to Carmen Seda and Mario Lucero, Social Studies Instructional Specialists! Carmen and Mario planned and executed a wonderful "Make and Take" session for 6th and 7th grade Social Studies teachers! The material was excellent and will help our students be successful in the coming unit. It also helped me get ideas for subsequent units. Thank you so much! Kudos to AREA at Alicia R. Chacon Int'l School! Great Job on your presentation for STAAR, TELPAS, and testing. Enjoyed learning! Kudos to Special Needs Staff at Eastwood Heights ES! I would like to recognize the special needs teachers at Eastwood Heights Elementary. For the first time in my years at Transportation as a bus monitor, the teachers at this school are working together with us as a team for the benefit of our students. Both teachers and assistants really make a difference in the lives of the children. Great job and keep it up. Kudos to Parkland area schools! Hooray for the Parkland area schools in their great support during the homecoming weekend, especially the parade. The floats, costumes, festivities, and community support is always over the TOP! GO Parkland! Kudos to South Loop ES Custodians! Our custodians are the finest! We appreciate you always. Kudos to Wendy Banegas at Presa ES! Mrs. Banegas is providing service excellence at Presa Elementary. She is providing complimentary popcorn to our campus visitors and/or parents on Fridays. Keep up the great work. Kudos to Dana Boyd at East Point ES! There you go again, putting the Ysleta District and the city of El Paso on the map. Congratulations on your recent appointment and newest honor of recognition! You go Girl! Kudos to Lulu Petrosky at Human Resources! Excellent job in keeping up with our staffing needs. You have been doing an outstanding job in helping us stay correctly staffed. The Transportation Department is truly thankful for your SERVICE EXCELLENCE standard. Kudos to Gaby Hernandez in the Accounting Office! Gaby, It's incredible how often you go above and beyond to help everyone. You are an awesome employee and I could never thank you enough for all your help. You Rock! Kudos to Janeth Felx and entire Child Nutrition Staff at Edgemere ES! Great menu, great food! My daughter, who is the pickiest eater in the world, tells me everyday how yummy her lunch at school was. Keep up the great work! Kudos to Beto, Gabriel, Rosario and Laura Guerra at Central Office! Gabriel and Beto walked me to Rosario and took their time to help me. Laura Guerra was so sweet and guided me to the paperwork that I needed. Also, Rosario took her gentle time to help me. Thank you! People like you are needed in this world! Kudos to Team Ysleta & Teacher Created Materials! AWESOME Job on our Math Conference! The presenters, materials and ideas were outstanding! It was an amazing day of learning that will truly impact all of our students in a spectacular way! Way to go! Kudos to Fernie Flores and his TIS team! A big thank you to Mr. Flores and his team in TIS for their continual support in making Ysleta - THE DISTRICT. Kudos to Gaby Hernandez from Accounting! You go above and beyond in your job duties and I just want to tell you thank you in your Running Mode! I appreciate you! Kudos to Nancy Perez and Jeff Cynor from Special Education! I would like to thank Nancy Perez and Jeff Cynor from the Special Ed department at central. They have been God sent and their help and knowledge have helped me have a better understanding of my new position. They truly will make YISD one of the happiest places to work for. Congratulations to Jennifer Delgadillo in being inducted into the El Paso Golf Hall of Fame. She is a tough competitor who plays to win. She represents our DISTRICT well. Way to go Jen! Kudos to Rosa Celaya, Senior Buyer in Purchasing! I could never thank you enough for all your help. I truly appreciate you and my thoughts may get away from me, but thank you for being you. Kudos to Isela Salazar-Ramirez from Lancaster ES! Your disposition, attitude and help is outstanding. I couldn't do my job without your help. Thank you! Also, thank you for being so helpful with everyone, especially our students and their parents and for always going the extra mile to help with online registration and engage me.You are awesome! Kudos to George Padilla from Bel Air HS! I really appreciate you going above and beyond with phasing in the new gradebook. The videos are highly appreciated. Kudos to Dolphin Terrace Elementary Staff! Our son Christopher Marsh has recently gone through open heart surgery. The Dolphin Terrace staff has gone above and beyond to help my son and our family through this tough time. Without the help and prayers from the awesome staff at Dolphin Terrace his journey to recovery would be a lot harder. We love Dolphin Terrace and its staff so much and we are forever thankful for what they are doing and have done for our son. Kudos to Lorena Olmos at TIS! Thank you so much Lorena for you continued help to all of the counselors with eschoools during the first weeks of school. You are a prime example of wonderful customer service. You are always ready to help and we really do appreciate you! Kudos to Mrs. Claudia Poblano at Del Norte Heights ES! Kudos for doing such an amazing job at Del Norte Heights! Her hard work, dedication and the support that she provides to all her teachers, parents and students is exceptional! Kudos Mrs. Poblano! Kudos to the entire Ysleta ISD! What a wonderful district to work for that has no problem stepping up to help those in need. The devastation left by Hurricane Harvey is a remider that we all need a helping hand sometimes. God Bless everyone and thank you to our Superintendent and his charitable vision. Kudos to Support Personnel at Del Valle ES! I would like to thank Lorena Cerecerez and Rachel Garcia, our Math and Science and Literacy Leaders, for all of their in-depth trainings. I appreciate their efforts to enhance our knowledge and quality instruction. I also appreciate that they are willing to meet with us individually to clarify and heighten our understanding of the curriculum. Thanks ladies! Kudos to Ms. Mae Reed at Plato Academy! As an assistant principal, she contributes to creating an environment conducive to learning. She listens attentively and engages fellow students with respect and empathy. Ms. Read coordinates many of the campus leadership boards including the Campus Improvement Team, Response to Intervention Committee (RTI), and Texas Accountability Intervention System committee (TAIS). Mrs. Read's drive is more than professional, because academics and teaching are her passion. I firmly believe the success in our school can be directly attributed to Ms. Read's leadership capabilities. Kudos to Mrs. Dolores Acosta at Cedar Grove ES! Kudos to Mrs. Acosta for being an active principal who is always available and making each student and family member feel special and welcomed. Thank You! Kudos to Nicholas Hinojos at Valle Verde ECHS! Kudos to Nicholas A. Hinojos for being vigilant and quick to act! Thank you for your "service excellence" and dedication to the students on your campus! Kudos to Lucy Diaz at Ysleta Elementary! Mrs. Diaz had applied and recieved a grant for our school's library from the Laura Bush Foundation for the 2017-2018 school year. Thank you Mrs. Diaz for caring for our kids! Kudos to Christine Gerlach and staff in Purchasing Dept.! Thank you for the AWESOME job you and your staff do everyday! Keep up the GREAT job of going above and beyond. Kudos to Central Office Personnel! I wanted to thank the Mission Valley Team and Central Office Transportation Crew that assisted in the flow of traffic, opening car doors, and making parents and students feel welcome this first week of school. Way to go YISD Staff in making us feel safe and secure during this chaotic time with construction and downsizing all happening so close to our kids! Kudos to Mr. Gomez from Indian Ridge MS! I want to thank Mr. Gomez for taking the time to help me out with registration documents that I was asked to get for my child's Hanks registration. He went above and beyond in trying to help during a very frustrating registration process at Hanks. Thank you! Kudos to Mr. S. Balderrama at Del Valle Elementary! I would like to THANK our AWESOME parent volunteer for doing an amazing job in getting our ISN books ready for our Kinder and 1st Grade teachers. They would not of been ready if it weren't for him. THANK YOU! Kudos to Maribel Martinez at Ysleta Pre-K Center! Kudos to educator Maribel Martinez for her selfless Random Act of Kindness! Maribel exemplifies the best of YISD Service Excellence! Thank you Ms. Martinez! Kudos to Daniel Gomez, Assistant Principal at Indian Ridge MS! Mr. Gomez went above and beyond to help parents of incoming Freshmen transfer students starting the year at Hanks High School. He was so helpful in providing the required documentation and making the process easier. Thank you Mr. Gomez! Kudos to Valley View MS office staff! Kudos to Ms. Solis, Ms. Ramos, and Ms. Flores for hitting the ground running as soon as they were back on duty. AWESOME TEAM! Kudos to YISD Security Officers! Special thanks to all YISD Security Officers for their continuous efforts in keeping all of our YISD community safe and secure. Their countless hours of dedication to our district goes unrecognized and taken for granted far too often. There's a reason why this department has been recognized as the top school district security in all of Texas. Take a minute to thank your security personnel. We appreciate everything you do! You did an awesome job with the district website video. You are an amazing, talented and professional individual! You make us and TheDistrict proud! Kudos to VVMS Office Staff! Kudos to Ms. Garcia, Ms. Alvarado, and Ms. Chavez for working online registration since July 31st! You ROCK! Thanks for "Exceeding Expectations" and helping families from other schools within our district. Kudos to Technology Information Services! I would like to say thank you to Ms. Mary in the technology dept. She assisted me with such kindness and patience ! She was a great help with the online registration process. You really need more employees like her ! Very happy with the help she provided. Thank you once again! Kudos to Ms. Micha Villareal and the IT Department! Thank you for helping VVMS with our online registration set up. Thank you Larry Snyder for setting up our Chromebooks.Service Excellence! Kudos to Middle School Academic Team at Riverside MS, Indian Ridge MS, and YWLA! A huge THANK YOU to the District's Middle School Academic Team for bringing in Dr. Kendall to train the instructional coaches. Your foresight and support to improve our craft is greatly appreciated! Kudos to YISD Technology Information Services! Kudos to YISD Technology Information Services for their support to parents during the online enrollment process! Thank you for the extra time put in to address their questions! Kudos to Katherine Nance from Parkland High School! Good Luck Katherine on your new adventure. You will be greatly missed. Amazing leadership from Mrs. Serrano, Ms. Judy, Mrs. Perez, and Ms. Lopez! Thank you for your commitment and passion to the Ysleta Summer Program. Thank you Team Ysleta teachers and staff for the amazing learning opportunities you provided to our students. Ysleta Summer Pl@y program was a success because of all of you! Kudos to Dr. Darryl Henson from Parkland HS! Dr. Henson, thank you for bringing pride back to Parkland High School. You will be missed. Kudos to Isidra Ochoa and Jennifer Delgadillo from Budget and Accounting! Thank you ladies for all your wonderful help and patience this school year. We couldn't have done it without you. You're the best! Kudos to Christine Gerlach, Mary Haynie, Jessica Moreno, Monica Vasquez, Jose Soto, Raul Moreno, and Lidia De La Cruz! Trooper clap for a job well done! Your quick response in helping to resolve a dilemma is greatly appreciated. I cannot thank you enough for all of your help. Kudos to Del Valle Area Assistant Principals Ms. Quinonez, Mr. Puga, Mrs. Youngs, Mrs. Guevara, and Ms. Jacquez! Del Valle Summer School Program is a huge success! Thank you to our outstanding summer school administrators.Your commitment and dedication to our students does not go unnoticed. You all Rock! Kudos to Bel Air Feeder Summer School Assistant Principals Mr. Barraza, Mr. Harris, Ms. Duran, Mr. Reyes, Ms. Rodriguez, and Ms. Bustamante! Thank you for creating a welcoming environment for both teachers and students. You have gone above and beyond to make this experience memorable. You have captured, inspired, and taught us an exemplary way to engage and motivate teachers and students. Kudos to Hanks Area Elementary Assistant Principals: Glen Cove, Tierra Del Sol, Pebble Hills, R.E.L., and Vista Hills! Great job Ms. Quinonez, Mr. Flores, Mrs. Blair, Mrs. Saucedo, Ms. Kyle, and Ms. Holguin for your hard work in coordinating a well-organized summer school experience for our students. Everything ran smoothly these first couple of days thanks to your effective planning and execution! Kudos to Efrain Gaytan from Grounds and Pat Ayala from Public Relations! Thank you for all your assistance with graduation. It would not be possible without you! On behalf of my kids, faculty and community, a sincere Thank you! Kudos to North Star ES Principal, Teachers, and Coaches! I would like to thank Coach Bravo, Coach Borunda, & Ms. Orpinel (5th grade) for their patience and showing great kindness & care. Miss Guerra, Miss Fran, & Mr. Reyes at Special Education SSC Unit 1 for being phenomenal. Principal Balderrama, thank you for being a great leader! Kudos to Del Valle teachers, staff and community members! I would like to thank all of our team for a successful STEM Fair! Not only did the student displays represent all of what STEM stands for, but our students were also given the opportunity to engage and further their knowledge via the presenters that attended our event. Great job Del Valle team! Kudos to Homero Silva from Ysleta Middle School! To an educator of educators! Thanks for converting our mistakes into lessons, pressure into productivity and skills into strengths. You really know how to bring out the best in us. You will be missed by all. Kudos to Officer Armendariz, Officer Acosta and Officer Noel! Thank you officers for all of your hard work, professionalism, and committment to our campus. We appreciate everything you do to ensure our safety here at Parkland Middle School! You rock! Kudos to Indian Ridge Middle School orchestra students! Thank You to Ms. Kelly Weddington, Hanks High School orchestra director, for all your hard work with the Hanks feeder pattern throughout the school year! Kudos to Principal Lorraine Martinez and Admin. Team at Dolphin Terrace ES! Thank you so much and the entire office staff for your great show of love during Teacher Appreciation Week! As always, Dolphins are over the top when it comes to expressing ourselves! Loved the treats and gifts! Kudos to Cleo Flores at Del Valle ES! Thanks Ms. Cleo for all of your support! The PD room looked fabulous and everything was spectacular! Thank YOU! Kudos to Mrs. Melvin at Vista Hills ES! Congratulations to the Robosaders Robotics! You all did an amazing job at the conference in Albuquerque, NM. Ms. Melvin thank you for your hard work and dedication to our students, your job does not go unnoticed! Kudos to all YISD School Nurses! Happy School Nurse Day on May 10! I would like to take this opportunity to thank all YISD Nurses for their incredible dedication and commitment to their students and profession. I hope you have a wonderful day! Kudos to Internal Audit Department! I would like to wish my department family, Happy Internal Audit Week! I'm very blessed to work with such a great team. Kudos to Jessica Fette, Nancy Gonzalez-Uribe, Bernadette S. Rey and Heather Holmes, YISD's Top 5 Elementary Teachers of the Year! Congratulations to each of you. It was an honor to be included with such a distinguished group of educators. Our jobs are all different to some degree but our mission is the same. We give our students 100% of ourselves guiding them to be the successful individuals we know they can be. Kudos to you all! Kudos to Coach Anthony Carter from Hanks HS! Congratulations Coach Carter on being inducted into the El Paso Athletic Hall of Fame! You've had an incredible year. We're extremely proud of you and all your amazing accomplishments! Kudos to Attendance clerk at Indian Ridge Middle School! Kudos to attendance clerk for always having a nice word for parents and students. I appreciate your kindness. Kudos to Ron Duran at Vista Hills ES! Many thanks for all the hard work you do to keep our school clean. Your hard work is greatly appreciated. All the blessings of the world to you and your family. Kudos to Virginia Rey in Library Services! Thank you Virginia in Library Services for being such an amazing leader, teacher and advocate for all our libraries and students! Your hard work and dedication is greatly appreciated! Kudos to Mr. Humphreys at Eastwood Knolls Int'l School! The Spring Concert was amazing! You can clearly hear all the hard work you have done with all the students. Thank you for the great job and devotion you have shown all the children. Good job EKIS Band! Congratulations on being named into the El Paso Women's Hall of Fame! 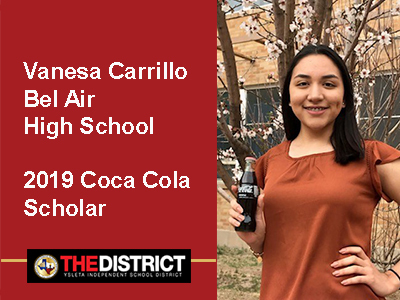 You continue to make our district and our city proud! Keep fulfilling your purpose! Kudos to Mesha Daniel from Innovative Technology Dept.! Thank you Ms. Daniel for helping out at Del Norte Heights ES by being a special guest reader for our Words of Wisdom segment in our morning announcements. We appreciate you taking time out of your busy schedule to record your WoW segment for us. The kids loving having guest readers. Kudos to Lucy, Ruby, and Stephanie from Del Norte Heights ES! I'd like to thank these three hard working ladies that run our school because without them we'd truly be lost. Thank you for never staying no, for always have smiles on your faces, and always going the extra mile to make everything run smooth around here. Happy Administrative Assistants Week! Kudos to Cheryl Mata and Becky Freishenhan from Accounting! I would like to thank Becky and Cheryl for going above and beyond. They know why! Thank you, thank you, thank you! Kudos to Israel Galindo from Camino Real MS! For being an exceptional teacher. The way he interacts with students in such a positive way (male role model). For getting to know the capabilities of the students academically and planting the seed of grow in that direction.You are awesome and greatly appreciated. Kudos to Martha Torres-Garcia at Pasodale ES! Kudos to the Riverside HS Rangerettes! Congratulations to the Riverside Rangerettes and Director Melissa Nava for their grand champion win in their division at the Showtime International competition held at Six Flags in San Antonio, TX. Great job ladies. All the hard work all year paid off. As part of this win, they are invited to participate in Macy's Parade & Citrus Bowl half time show. Damian and Danielle were awarded 1st place - Weather Segment Category at the Student Television Network (STN) International Competition in Anaheim. The only high school team from Texas to win 1st place in any category, and only El Paso team to place in any category! Kudos to Nurse Michelle Beebe at Ascarate ES! Kudos to Nurse Beebe on an AMAZING Blue Ribbon Week and raising awareness for Child Abuse. Thank you for all your hard work and dedication to our students, our school and our community. Kudos to John Lara and Stacey Calvillo from Desertaire ES! Thanks for all you do for the students and teachers at our campus. You two are an excellent example of what an instructional coach should be. Your willingness to always jump in and help is really appreciated! Kudos to the YISD Wellness Clinic! We are truly blessed to have such a great staff in the YISD Wellness Clinic. Our family depends on them so much and they have diagnosed all our medical needs perfectly. From all our HEART, Thank You! Keep doing what you do! Kudos to KEHS Film and Broadcast Team! Congratulations to Eastwood's KEHS Film and Broadcast Team for placing at this year’s Student Television Network (STN) International Competition in Anaheim CA. 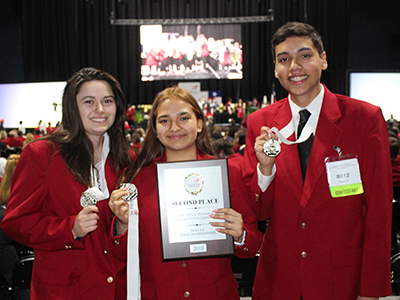 Danielle Gutierrez and Damian Soto Placed 1st in the Weather Segment Category. I am extremely proud of my students and the way they handled the stress of such a large competition. Kudos to the Lady Ranger Basketball team at Riverside HS! Congratulations to Lady Ranger basketball Senior Kayla Galindo for being named to the All City 1st team. Sophomore Alex Espinoza was named to the All City 2nd team. Kayla Galindo was also named the District 2-5A MVP. Charlize Bustillos was named the newcomer of the year. Ana Martinez and Alex Espinoa were selected 1st team All-District and Sabrina Minjarez was selected to the 2nd team. Great Job Rangers! Kudos to Velia Campos from Bel Air HS! You have displayed the true meaning of "hard work, loyalty, & dedication." Your words of wisdom go very far and touch many lives. Thank you! BAHS attendance rocks! Kudos to Christopher Hulburt from Eastwood High School! Kudos to Palo Verde Homes! Ysleta Pre-K Center would like to thank you for your generosity and support towards our students and volunteers. A heartfelt thank you for the donation of the volunteer team shirts! You are greatly appreciated! Kudos to Jessica Moreno in Budget! For as busy as you were during budget deadline week, thank you for your attentiveness and willingness to help! Kudos to Alex Armendariz, Bel Air Middle School! Great Job Mr. Armendariz on STAAR testing! It ran smoothly, and you are appreciated for all that you do for the students, faculty, staff and families at Bel Air Middle School. Kudos to Leo Benitez in Transportation! Mr. Benitez, Thank you for going over and beyond and figuring out transportation for our swim team practice. Your diligence is greatly appreciated! Kudos to Abrahan Robledo and Bernie Villagrana at Ysleta MS! Congratulations on your awesome recognition, very well deserved. You both are a tremendous asset to YMS, so proud to have worked with you both. Enjoy your year and congrats again! Kudos to 21st Century after school program at Indian Ridge MS! Kudos to all the Hawks who participated in the after school program (teachers and students). Good luck with the STAAR tests, you rock! Dedication will pay back. Kudos to Volunteers at Constance Hulbert ES! Thank you to our amazing volunteers...We appreciate all the hard work and dedication to our students, teachers and staff! Kudos to Mrs. Rosie and Mrs. Debbie at Mission Valley ES! Kudos to the two ladies in the front office at Mission Valley for their outstanding support! Going above and beyond to assist our cafe on Thanksgiving Day, Christmas Day and Abuelita Day. I would also like to thank them for continually taking excellent care of all our needs without question. Thank you! Kudos to Mrs. Jessica Fette from Cedar Grove ES! Congratulations for being selected a Top Five Elementary Teacher of the Year. We recognize you for your exceptional hard work and dedication. Thank you for making Cedar Grove proud! Kudos to the 2017-2018 Campus Teachers and Support Employees of the Year! Congratulations to all of the 2017-2018 Campus Teachers and Support Employees of the Year! I would especially like to congratulate our good friends: Mrs. Karla A. Bazan @ Del Valle ES, Ms. Heather Holmes and Mrs. Donna Murray @ Pebble Hills ES, and Mr. Nicholas Flood at Indian Ridge MS! We are very proud of you! Enjoy your year! Kudos to Vivica Carlos, nurse at Dolphin Terrace ES! What an awesome Health Fair you put together! So many vendors, free and helpful information, student participation from the Parkland area schools….just awesome! Thank you for doing your best to keep us all healthy. Kudos to Mr. Pedro Solis and staff at the Academy Cafe! Your Lent Menu on Friday is the best in town. Your dedication and professionalism to great cooking does not go unnoticed. Thank you for your outstanding costumer service and always serving with a smile. Kudos to Brenda Quintana, Dolphin Terrace Librarian! Kudos to excellent use of our DT community in the Read Across America activities! All of our guest readers were a joy and the students had fun. Thank you for engaging us in such a positive way! Kudos to Cecelia Williams at Ascarate ES! Excellent job on spearheading the Black History Program at your school last month! The staff, students, and guests supported and participated so well and everything came together to make it a huge success! Kudos to Bonny Schulenburg in Public Relations! Congratulations to Bonny Schulenburg for being inducted into the 2017 Hall of Fame by the El Paso Commission for Women! Bonny exemplifies professionalism and civic engagement in all she does for YISD and the El Paso community. Best wishes on a well deserved recognition, Bonny! Kudos to Mary Escarciga at Rio Bravo MS! Congratulations to Mary Escarciga and her orchestra for getting Sweepstakes at UIL Orchestra Competition. Thank your for your hard work and dedication to your students at Rio Bravo MS. Kudos to Blanca Ochoa from Transportation! I would like to thank Blanca for taking over the route on bus #179 she did a great job with the students! Kudos to Anna Munoz in Transportation! Thank you Anna Munoz & the entire transportation department for doing such a great job and always with great customer service. Kudos to Riverside HS Vocational & Trade School Students! I would like to recognize the students and teachers for a job well done during their February competitions. Keep up the good work and motivation. Good Luck for the ones that are competing at Corpus Christi. Kudos to YISD Purchasing Dept.! The ENTIRE purchasing department is AMAZING! The work load that these incredible people process alone is mind blowing, but add the fact that they always have a POSITIVE and HELPFUL attitude is to be commended!Purchasing Department is what THE DISTRICT is all about! Kudos to Norma Vela at Riverside/Eastwood High Schools! IT knowledge is an absolutely critical area for student success; equally important is teacher IT abilities. Unfortunately, I am "old school;" (not a digital native) and not as fluent in the latest iterations. However, I am extremely fortunate in that colleague NORMA VELA is gifted and gave much of her time to assist me in preparing a specific lesson plan for our students. Thank you very much, Norma! Kudos to Coach Carter and the Hanks Girls Wrestling Team! Congratulations to the Hanks girls wrestling team for winning your fourth consecutive state championship! Also a big congratulations to Coach Carter for winning National Coach of the Year! Such amazing accomplishments by all of you! Please know your hard work and determination does not go unnoticed. We are all so proud of you! Thank you for being the shining stars on the campus! Kudos to Julian Torres and Julian Ruiz, Mini Troopers Robotics Team! AWESOME JOB and congratulations on winning Excellence Award, Teamwork Challenge Award & Robot Skills Champions Award at the Eastwood Middle VEX IQ Tournament. Good Luck at State! Kudos to Ms. Josephine Flores (1st grade), Ms. Jennifer Rau, Ms. Cynthia Mayorga (6th grade) and Mr. Jose Perez, principal at Edgemere ES! I just want to say thank you all for the outstanding work you do with my 2 boys. Your hard work, patience and dedication to your profession shows. My 2 little ones enjoy going to your class and learning new things and you guys are the reason for it. Keep up the good work! Kudos to Mrs. Spencer, Counselor at Pebble Hills ES! Many people don't understand what they are going through and eventually they come to you seeking advice. I have been told that talking to you makes them feel relieved and much better at the end of the day. Not even words can describe how awesome it feels after seeking your help. Thank you for all you do! Thank you for being you! Thank you for showing love and kindness to everyone, to include our students, teachers, administration, staff and parents. Hope you have an awesome and Happy Counselor's Week! Thanks so much! Kudos to Mr. Flood, Band Director at Indian Ridge MS! Mr. Flood's dedication to his students and the music program is awe inspiring. From the 2017 Middle School Honor Band concert to the All Region Band performance and every practice in between, Mr. Flood consistently gives 110% to his students and his job! Thank you Mr. Flood! Kudos to Ritchie Vasquez and the Valley View football staff! I just wanted to give a shout out to Coach Ritchie Vasquez at Valley View Middle School on his undefeated and district championship season for 8th grade football. He does an outstanding job motivating his kids. He is a passionate and sincere coach. Congratulations on another district championship. Kudos to Janise Pries, Mark Parra & Dr. Kennedy! Thank you Janise Pries, Mark Parra and all who work in the Guidance & Counseling department for the counselor appreciation luncheon. The inspiring words of affirmation and encouragement by Dr. Kennedy was special. Kudos to Jim Luevano at TIS Dept! Kudos to J. Yildirim and R. Asam at YWLA! AMAZING JOB LADIES! 1st Place District Science Fair! Your hard work and dedication to our girls and our campus shine! Kudos to Parkland Wrestling Coaches! Coaches, I was really impressed by the wrestlers performances at the Bowie Invitational. I have seen a great growth in the wrestling program this year. Thank you for all your hard work and dedication to the wrestling team. Go Matadors! Kudos to M.Agness, S.Padilla, E.Vera, I.Ortega, P.Ocana & L.Velasco from YWLA! Thank you so much for stepping up and taking on 6th Grade UIL! Our girls did amazing and took 2nd place UIL Sweepstakes. Thank you for your hard work and dedication. Amazing job everyone! Kudos to Riverside High School Academic Decathlon Team and Coaches! Congratulations to the Academic Decathlon Team and to the coaches for their strong showing in this year's Ysleta Academic Decathlon Tournament. Riverside overcame medium-sized school favorites and delivered a strong performance worthy of the second place finish! We are hungry for a first place finish and look forward to what the future holds for Riverside Academic Decathlon! Kudos to the guys from plumbing. Ray, Manny, Mike and Louie work very hard, and their work ethic never goes unnoticed. They always resolve our plumbing issues in a timely manner! Kudos to Volunteers at Desertaire ES! Volunteers, thank you for all you do for Desertaire faculty and staff. You are great at decorating doors, making popcorn, helping with dances, making copies, lunch and outside duties, sharpening pencils and cutting poster boards for testing dates and everything else... We appreciate you! Kudos to Coach V., Mrs. Vandagriff, and the entire Hanks Swim Team! Congratulations on your fifth straight District Championship! Kudos to Principal Beth Harbison, Asst. Principal Ms. Buso and Ms. Triplett from Desertaire ES! Thank you admin for thinking about us and rewarding us with juice and yogurt on Thursday morning. Small gifts like these make us feel good and have the desire to work harder. We really appreciate you THREE! Kudos to Efrain Gaytan and crew at YISD Grounds! Once again, like the last 9 years, thank you for creating magic moments for our students at Marian Manor. The individualized Christmas gifts from you and your crew made the children extremely happy. Your kindness is appreciated! From the bottom of this clerk's heart, "THANK YOU" for making my job easier/smoother! All of you in some way have been a teacher, friend, guide and have had patience with me and I want to say thank you to each one of you! May 2017 bring peace and harmony to everyone. Kudos to Mr. Navariz, Ms.Gooding, and 7th grade Texas History students! Thank you for inviting us and our students to share what you've been learning. Our students really enjoyed the projects you shared with them and walked away with a lot of new knowledge! Kudos to teachers, administrators and staff at Lancaster ES! Congratulations for the effort, commitment, and love they put in every day. Happy New Year! Kudos to Ana Montes in Purchasing! Thank you for always smiling, helping and being efficient while doing your job. Kudos to Daniel Martinez at Eastwood High School! Job well done on creating the Eastwood High School video for the faculty and staff Christmas party. You are doing an awesome job teaching students how to be innovative and go above and beyond while learning new skill sets! Kudos to Norma Garcia at Desertaire ES! I just want to thank Norma Garcia for all the hard work that you do on a daily basis with attendance. I have really appreciated everything that you have done from the bottom of my heart! Kudos to RHS English Department! Kudos to Claudia Martinez at Innovative Learning! A huge thank you to Claudia for her help in getting my video students an adapter we needed to complete our project with a tight deadline. She played a crucial role and did so with a smile! Kudos to Ms. Virginia Padilla at Marian Manor ES! Thank you for all your years of dedication, leadership, guidance and support to students, parents, faculty and staff. THINK, BELIEVE, DREAM and DARE! The best years are ahead of you, enjoy your retirement! Kudos to the YISD Electricians in Maintenance! Thank you to our YISD Electricians for helping to re-wire our Library and 3 classrooms so our heaters would work! Kudos to Cheryl M. Chapline from Child Nutrition Services! A big kudos to Ms. Cheryl Chapline. Thank you for the many laughs and a few tears now and then. I will greatly miss our morning coffee and our talk of what we did the prior day. Enjoy your retirement and thank you for always being there for me. Love you. Gaby, I want to thank you for helping me and always having a positive attitude when it comes to helping. Kudos to Nancy Perez and Jeff Cynor, Autism team! You have done an amazing job as a team helping out at one of our campuses. As a team, we have managed to come together to make it look awesome. The students are happy, the environment is great, and it is coming together. Awesome team! Kudos to everyone of you! Thank You! Kudos to Mr. Albert Macias, Warehouse Manager! Thanks a lot for your help, always there to solve the different requests from our campus (Presa Elementary School) as quickly as possible. Kudos to the Custodians at Desertaire Elementary School! Desertaire would like to welcome our new Head Custodian, Luis Serna. Also, he wants to thank his crew Ramon, Ceci, Abraham, Mayte and Maggie for all their help and hard work. Kudos for David Lopez team at the Maintenance Department. Thanks for the excellent job in the Computer Lab in Presa Elementary School. Thanks Mr. Lopez, to you and your fabulous team. Kudos to Marta Amador and Jesse Gonzales from Transportation! Thank you for the care and kindness you show to the kids on Bus 219. It gives me peace of mind to know they are happy, safe, and comfortable going to and from school and it makes a big difference in their day. Thank you! Kudos to Mr. Duque from Glen Cove ES! Thank you for all your time and hard work at Glen Cove. Best wishes on your retirement! Kudos to Luis Cardona from Desert View Middle School! Thank you Mr. Luis Cardona for hosting parent classes and holding Family Wellness Nights at Marty Robbins Park for staff and parents to participate together. Thank you for providing parent volunteers for our NJHS Halloween Dance and other events. Way to Go Stallions! Kudos to Dolphin Terrace cafeteria manager Lydia Rincon and staff! Just want to say thank you ladies for a super job on the annual Thanksgiving Meal! The service with a smile, delicious food, and beautiful decorations really set the atmosphere for a pleasant dining experience for our students and their families. You are the best! Kudos to Susana Burford at Special Education! Thank you for always being there to guide and support me and all the other special need families who cross your path. You never fail to come through even when time has passed between crisis, you are an integral part of YISD and very much appreciated. Kudos to Mr. Salcido of the Math Dept. at Hanks High School! Congratulations on representing the Kingdom as our Teacher of the Year! A big Thanks for your drive and love of math and the time that is spent for the success of our Knights! Kudos to Edna Rodriguez and Sara Ramirez at Del Norte Elementary School! Thank you both for all your hard work and support with Generation TX Week. It was a success and meaningful experience for all of our students. Kudos to Monica Lopez and Interact Club at Hanks High School! It might not be said much, but THANK YOU Monica Lopez and your wonderful Interact students for always finding a way to make HANKSgiving happen! Every year you all give selflessly of yourselves to feed 500 families for Thanksgiving. You begin each year in July and work tirelessly until the weekend before Thanksgiving to make sure every basket is filled. Please know your hard work does not go unnoticed. All of you are appreciated very much! Kudos to Cheryl Mata in Travel! Two thumbs up to Cheryl in travel for always being so helpful and doing so with a great attitude. Thank you! Kudos to faculty and staff at South Loop Elementary School! Thank you Ms . Norma Lopez for her hard work and dedication to our staff and students! Kudos to Sandy Larios, Librarian at Eastwood Knolls Int'l School! Thank you for all you do for the staff and students at EKIS! You are always willing to go the extra mile with our Twitter account, the KidVote! campaign we had this week, as well as hosting the amazing author Joe Hayes for all of us to enjoy! Kudos to Taliah Dancil from YWLA! Congratulations on winning "Chopped Junior!" You showed grace, composure and sportsmanship during the competition. You made YISD and El Paso proud! Kudos to Mario Gomez at Transportation! Thank you for doing all that you do, especially for your extra hard work to make sure all bases are covered and for your professionalism in dealing with not-so-patient parents like myself. It is very much appreciated. Kudos to Malinda Villalobos, Principal; Lisa Boatright, Academic Dean; All Faculty and Staff at YWLA! Congratulations to all the young ladies at YWLA for accomplishing such a grand honor at your pinning ceremony October 30, 2016! Thank you Mrs. Villalobos, faculty and staff for organizing such a beautiful and memorable ceremony! What a wonderful achievement! Kudos to Arleen Garcia from Riverside High School! Arleen, thank you so much for all the things you do for me. You are truly "amazingly wonderful." I really appreciate you. Thanks! Kudos to Sylvia Belmontes, RN from South Loop ES! Thank you to Sylvia Belmontes, R.N., from South Loop Elementary for the excellent presentation on Tuberculosis to the YISD school nurses during inservice. Your professionalism shines. Kudos to Micha Villarreal, Mesha Daniel, Larry Snyder, and Alex Reyes from Innovative Learning Dept.! Kudos to all of you for working with the counselors. You were patient, helpful, and engaging. One of the best trainings I've attended all year. I wish we could have spent the entire day with all of you. There's so much to learn and you teach it so well. Thanks again! Kudos to Maria Amato from Transportation! Thank you Maria Amato for all of your caring support as a bus attendant to our 25 PPCD students from Ysleta PreK that look forward to ride the bus because of your dedication. Each child continues to receive your undivided attention and patience by teaching them to say "Good Morning" and "Good Afternoon." I see how you put an extra smile on their faces each time you award them on Fridays. They are happy to have you. Kudos to YISD Transportation Dept! Special thanks goes out to all of the hard working School Bus Drivers that have helped transport our Band students, staff and Band Boosters to all Band events throughout this year! You have done an outstanding job taking care of each and everyone of us by always caring about our safety first and getting us back to our home schools safe also! Thank you for your kindness and respect! Have a great year! Kudos to Danny Gurany from Riverside High School! Thank you so much for offering to host our National Qualifying meet for West Texas NSDA. We had originally asked another school but they declined because of another contest on their campus the previous week. We appreciate your support of Speech and Debate in the El Paso community! Kudos to Ms. Vasquez at Pebble Hills Elementary School! HAPPY NATIONAL PRINCIPALS MONTH! Everyone at PHES Loves You! Hugs! Kudos to Adam Ulloa & Fine Arts Staff! Another fantastic Fall Festival! Congratulations Adam Ulloa & Fine Arts. Kudos to YISD Transportation Dept.! In recognition of National School Bus Safety Week, I would like to thank all of the automotive technicians for servicing our buses and keeping them up to par on a daily basis. You are greatly appreciated. Kudos to Danny at the Print Shop! Thank you Danny and the Print Shop department for always taking care of our campus printing needs in a timely manner. Especially Sharon Wells curriculum! You guys are AWESOME! Keep up the good work! Kudos to the YISD school bus drivers! Kudos to Javier Ramirez from Custodial! Thank you for your fast replacement of the lights in the downstairs parking. It is much safer to see and not have any accidents. Many thanks and muchas gracias for all the hard work you do to keep our buses clean. Your hard work is greatly appreciated. More power to you! Kudos to the teachers at Bel Air High School! For rising above and having GRIT. Kudos to the Presa Elementary staff! Grandparents Day was awesome. The Mexican music was just great and took me down memory lane. Good service was excellent. Mrs Lujan is the best of the best. Great job Presa. Kudos to Dr. Diana Otero from Special Education! Thank you being so supportive of our campus and always going the extra mile! Kudos to Ms. Padilla, Mrs. Poblano, and Student Council Students and Parents! Kudos to Chris Gee at Riverside High School! Thank you, Mr. Gee, for your hard work and dedication, and for helping take care of our staff! Kudos to Alfonso Lira at TIS! YCLC appreciates the immediate attention to our tech issues and ALWAYS with a smile. Alfonso, you exemplify the gold standard for customer service! Thank you for all that you do! Kudos to the Hanks High School Marching Band! Congratulations to the Hanks High School Marching Band for winning the Coronado Marching Invitational on October 1st! You all have exceptional music and a phenomenal show! You all are the best band in our district! Thank you students for your hard work and dedication and to ALL the band directors for their commitment to excellence with our children! Go Knights! Kudos to Serena Ramos at Ysleta High School! Serena Ramos a 10th grade student in the Environmental Science and Engineering T-STEM Academy, has been selected to be part of the Student Board of Directors program by the Hospitals of Providence. This is a unique accomplishment very few students get selected to be part of this elite group. Serena has demonstrated her leadership qualities by being selected to form part of this committee. Kudos to Coach Bravo and Coach Borunda from North Star ES! Thank you for taking the time to acknowledge each child as a person and for showing them that they all matter. Your kindness does not go unnoticed. I also appreciate that you are instilling in my children the importance of exercise and of being healthy. Good job! Kudos to the Desertaire ES traffic control! Kudos to Crystal Caballero at Del Valle Elementary School! The fourth grade team would like to give a huge thank you to Ms. Caballero for doing a phenomenal job on leading the character parade. Our kids did an amazing job due to your leadership and wonderful ideas on the presentation of responsibility! Kudos to Saribel Sandoval at Ascarate ES! We are very proud of Saribel for giving up her recess to go help the office staff by communicating in sign language with an elderly person that was lost. One of Saribel's classmates informed her the office staff needed help communicating in sign language and she did not hesitate to offer her assistance. Thank you for your service! Kudos to Hanks HS and feeder pattern crossing guards! You all do an AMAZING JOB getting our kids from point A to point B safely no matter the weather conditions. Rain or shine I witness hard work and dedication!! Can't THANK YOU enough. Kudos to Oscar y Isabel from Del Valle HS! Oscar e Isabel, gracias por siempre venir a la biblioteca cuando les llamo que se algo en la biblioteca!! Kudos to Ms Jill Strickland, Ms Valerie Alcala, and Dolphin Terrace ES office staff! I am grateful for Ms Strickland for her warmness in giving me information and especially to Ms Alcala for her patience and warmness in the delivery of school shirts for my grandson. Thank you!! Thank you Ms. Sonia for the great customer service you provide the Nurses. You are always very diligent and quick to fix any issues we have with our system. Thank you for your hard work! Kudos to Aaron Gomez at TIS! A big THANK YOU to Aaron Gomez from TIS for his support and dedication. We appreciate his wonderful attitude in helping the YWLA campus with technology needs, especially with the final installation of our new marquee! Great Job, Aaron! Thank you Mrs. Maritza Balderrama from North Star ES! Thank you for the phenomenal job you do! North Star is everything an elementary school should be and every time I walk in I am impressed. And congratulations on outstanding STAAR scores, everyone...staff and students alike... should be proud of themselves. You are a great leader, thank you! Kudos to Custodians Oscar Torres and Isabel Frias at Del Valle High School! Thank you Isabel and Oscar for your quick response to the A/C emergency in my library office!! I appreciate you!! Kudos to the faculty and staff at the Young Women's Leadership Academy! YWLA deserves a thumbs up for their awesome transition they have made for our girls to the new school. YWLA has done a great job in creating a family at their campus. My daughter couldn't be more happy to be part of this opportunity. The transition has been smooth and I am excited for what is yet to come. TRANFORMERS you ROCK! Keep up the great work YWLA staff and faculty! Kudos to Ms. Lori Rincon-Candia at Del Valle ES! I would like to give a HUGE THANK YOU to Ms. Rincon for freely opening her classroom and serving as a great testimony to what the LoneStar Program stands for. Her creativity and commitment to this program is empowering both students and teachers. Thanks Ms. Rincon! Keep up the great work! Kudos to Hanks High School Counseling Team and Mr. Anchondo! Thanks to Robert Balandran, Pat Almeida, Laura Likarish, Laura Torres, and Fernie Anchondo for all your grit and hard work assisting with getting our students accommodated and ready for the 2016-2017 school year. You all prove that "teamwork divides the task but multiplies the success." Thank you for all you do! Just want to thank Mr. Albert Macias and all the warehouse crew. They are always ready to assist no matter if it's a Friday at 4 pm. Awesome job and keep up the good work! Thank you transportation staff for your diligence and leadership in getting our students safely, on-time, and securely. Keep up the good work, the positive attitude, and the SMILES. Kudos to the Hanks High School football team! Thank you, Hanks High School football players, for visiting our campus and reading to our students! Leaders are readers! The 2016-17 school year is off to an excellent start. Many thanks to the custodial, maintenance, and security personnel throughout the district, especially at my home campus of Hanks HS. One of my other campus assignments, TLCC, is looking and serving our students extremely well in its temporary location after extensive & intensive work by the staff. And, last, but not least, TIS has updated my chancery--now I'm no longer a year behind! Thank you all! Kudos to Rodolfo Martinez and Miguel Garcia, Parkland High School! Great job on the first pep rally of the school year for Parkland High School. Thank you to both of you for all of your hard work and dedication to the students in the Parkland Area. Thank you Mario, David, Robert, and your crew from small construction for your terrrific efforts in getting our reserved stadium seats installed prior to the regular season. You all did a wonderful job on short notice, much appreciated. Kudos to Jessica Moreno in the Budget Dept. For always having time to help and answer questions and give guidance. Kudos to Ruby Shivery, Librarian at Indian Ridge MS! Congratulations for receiving the Dollar General Literacy Foundation Grant! Keep up the great work! Kudos to Valley View Middle School Office Staff! Thank you for a great start to the school year. It is very apparent the time and planning that went into the start up of this year. Everything went smoothly and that helps the rest of us hit the ground running! It is going to be a great year! VVMS Knows GRIT! Kudos to Mr. Rudy Ramirez at J. M. Hanks HS! A huge thanks to Mr. Rudy Ramirez, who always fixes my computer when it gets error messages. We appreciate you keeping the Castle running and working on all of our computers! Kudo's to Mrs. Alvidrez, our well loved Principal! Last year was her first year as principal and the transition was super smooth! This year was absolutley seamless. I just admire her way of being a top notch professional unmatched! I admire her way of using a personal touch with all her staff, support staff, volunteers and teachers. Her open line of communication is superb. Thank you Mrs. Alvidrez for treating us, the Cafe Staff the same. It means the world to us. Congratulations to the new principal at Eastwood Heights, Raul Mendoza, for doing the amazing work of getting campus staff, parents, and students to realize a new vision for this school year. Your patience and care have not gone unnoticed. You're a humble leader. Great job! Office staff at Desertaire, Mandy Contreras, Maria Elena Barragan, Monica Gavaldon, Marah Kiesel, and Norma Garcia. Thank you Mandy, Maria Elena, Monica, Marah, and Norma for all your extra work making the first week of school a great success. Your hard work and dedication has not gone unnoticed. Welcome to Desertaire new admin: Principal Beth Harbison, AP Elena Busco, and AP Monica Triplett. We are looking forward to a new school year because of your positive attitude and ongoing support! Welcome also new staff and teachers. Kudos to Mariana Rico, Division of Academics! Thank you so much Mari for your help and time. You did not hesitate to come to the rescue. we are in debt with you. Thanks again. Tierra del Sol Instructional Team! Kudos on preparing our teachers, Tierra del Sol is ready to Go for the Gold! Thank you so much for keeping our social media and our district homepage looking sharp! Kudos to Mr. Valdez, Mr. Valtierra, and Ms. Ordonez at Riverside MS. Thank You for such a positive week of P.D. and instilling faith..belief and great expectations from your faculty, staff, parents, students, and community...Excited about the coming school year! Thank you to Maribeth, Terry and Sandy at Edgemere Elementary for all your extra work making the first week back special for all the teachers and staff. The decorations were great and the food was delicious. You got us all soaring high right from the beginning. Thank you Bel Air teachers Mr. Antwine, Mr. Silva, Mr. Angerstain, and Mrs Gonzalez for being my teachers. You all are my inspiration. You all are awesome! Good luck in your new endeavor Mr. Gonzalez you will be missed. Thank you for always coming to the rescue, hospitality and great sense of humor. To the Riverside Middle School Learning Community, It has been a pleasure getting to know and learn from everyone in the Riverside Middle School Community. Everyone has been very welcoming and open to change for the betterment of our students. I look forward to a great year and the many success stories that are ahead of us. Go Rebels! Art, Danny, Lino, Yvette, and the gang at the Print Shop, Eastwood Middle School truly appreciates and thanks you for all you do for us! Your dedication is amazing! Mrs. Orzsulak, you will be greatly missed. Thank you for everything. Congratulations and good luck in your new endeavor! Great job Young Women's Leadership Academy! A huge thank you to the faculty and staff at the Young Women's Leadership Academy for a successful summer camp. Your vision, teamwork, and leadership is greatly appreciated! We are YWLA! Great job on leading Parkland HS pre Registration Mr. Garcia! Your knowledge and leadership was well appreciated! Way to go in putting not only The District on the map but bringing attention in such a positive way to our city! NO LIMITS is your calling. Great job Transforming Teachers, Staff and Administrators! Thank you for having a great camp for my daughter Hillary to go to. She is having a wonderful time getting to know her teachers and has made new friends! Go Transformers! Kudos to our fabulous custodial staff at Ascarate! Despite the limited time they had after Summer School to get our campus ready, they have come through and our classrooms are ready to go! Great job! Kudos to Bel Air High School Teachers! I would like to thank every Bel Air H.S. teacher for making this school year memorable. Great Job! Kudos to Cecilia Vasquez at Hanks High School! Two thumbs up to Nurse Vasquez! U did an amazing job in coming to the aid of one of your students. Your humbleness is recognized and very refreshing. Great Job Warehouse Crew! Great job Warehouse Crew in assisting with YISD's High School graduations! As always you come through with flying colors. Proud to be part of the TEAM!